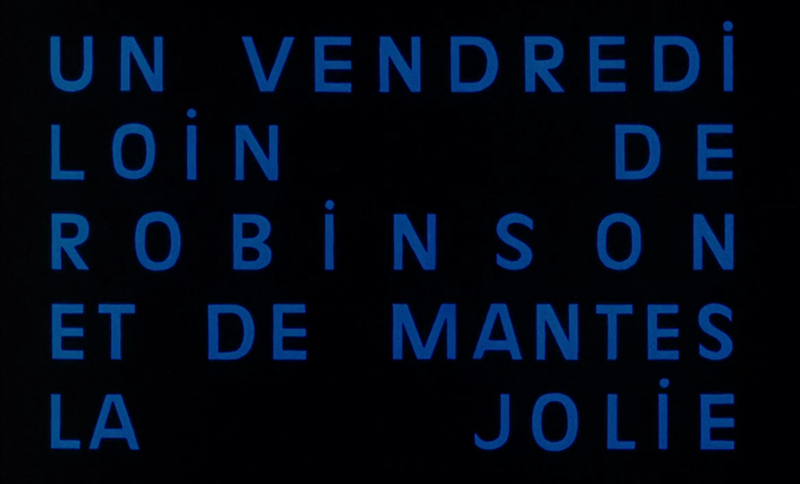 There are two conflicting temporalities on display here: in the space of six seconds, thirty minutes have passed, according to the titles. 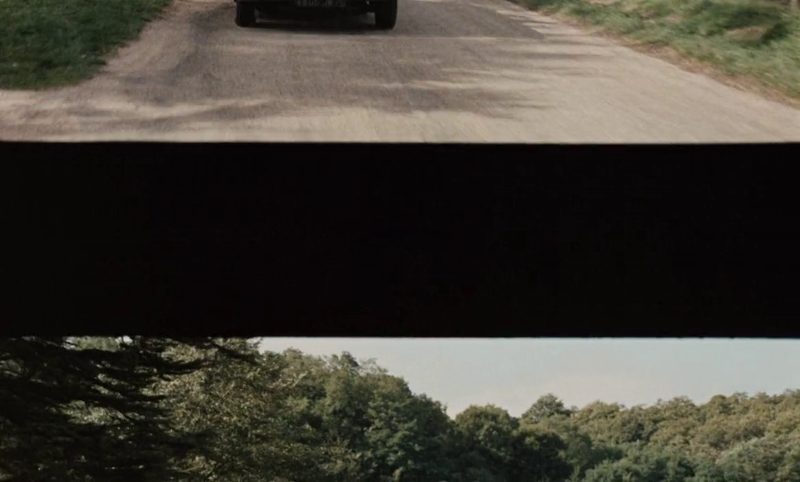 It is common for a cut to effect ellipsis, but here our strong sense of the continuity of pro-filmic action and of camera movement makes that ellipsis seem unfeasible. 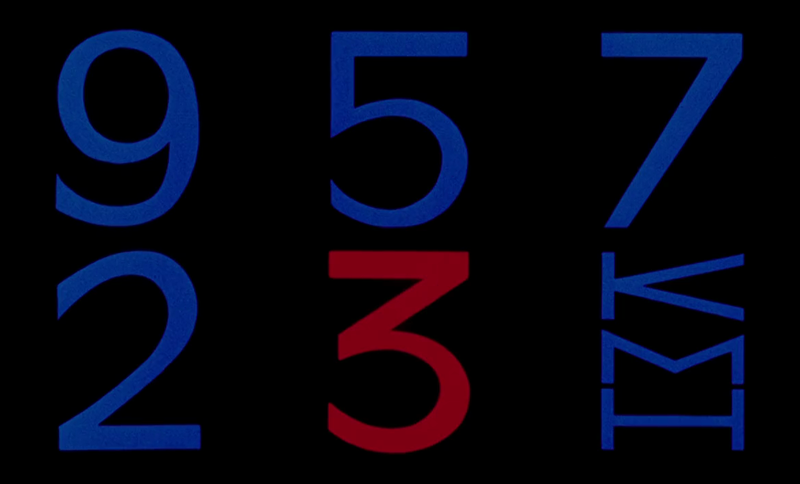 We are more likely to believe in the six seconds of pro-filmic or story time, rather than the thirty minutes of typographic or discourse time. 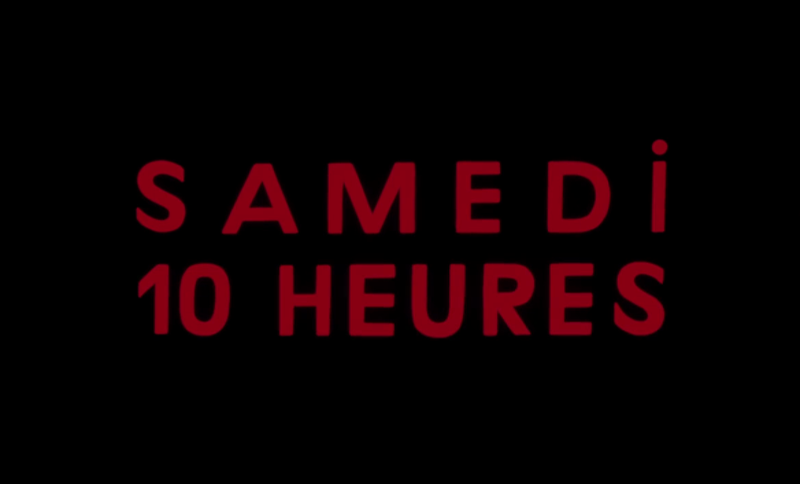 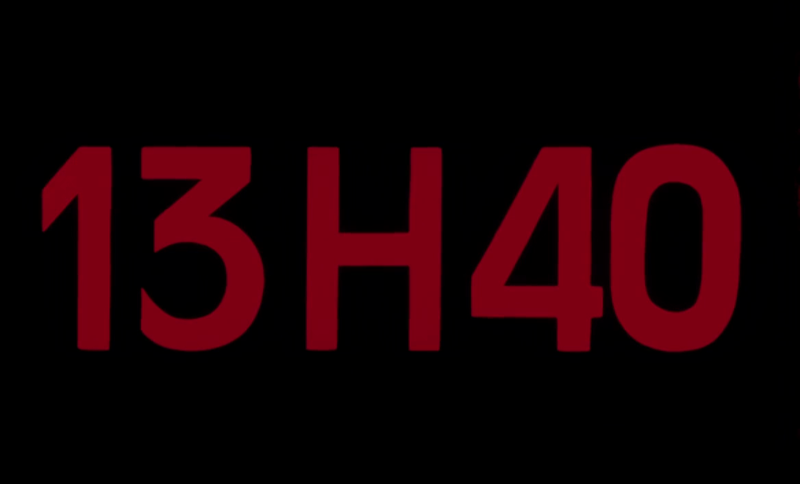 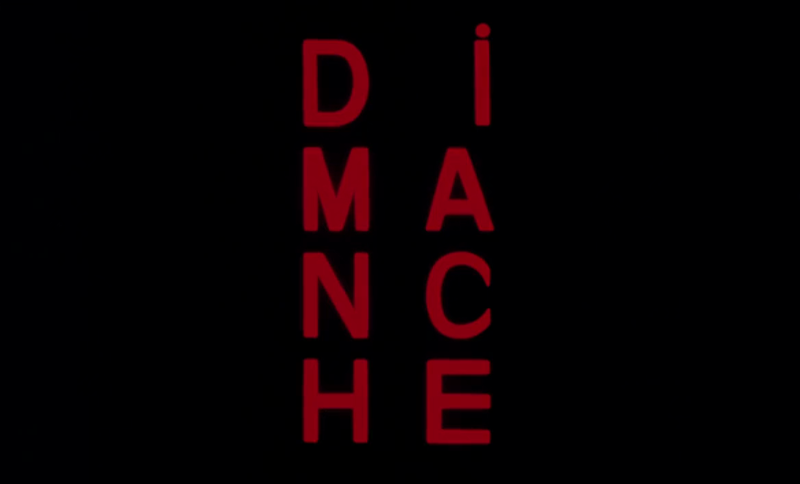 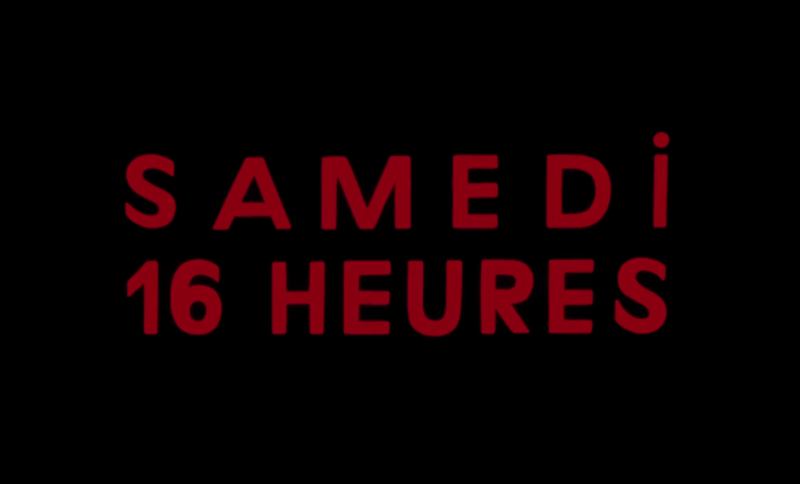 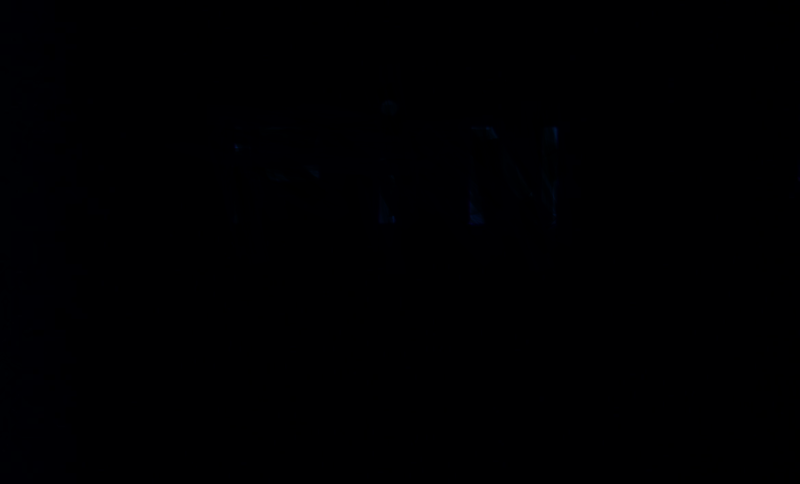 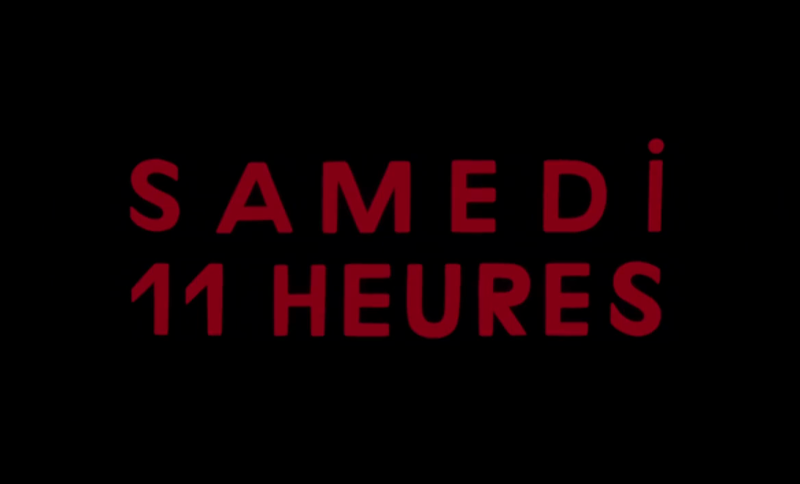 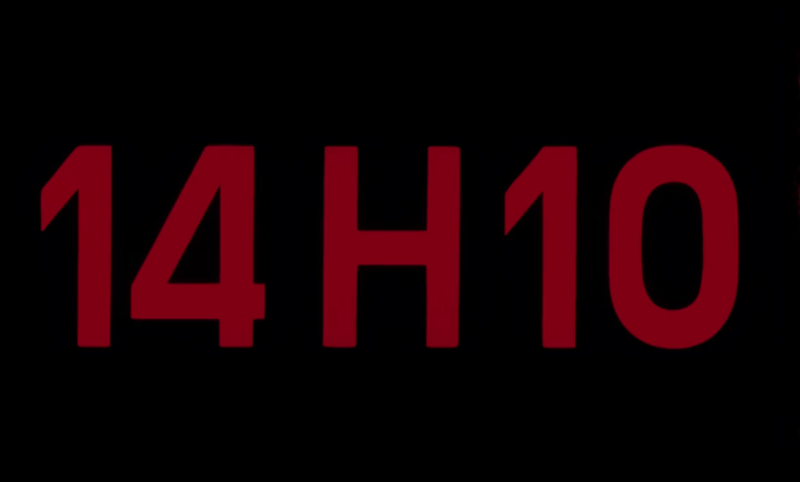 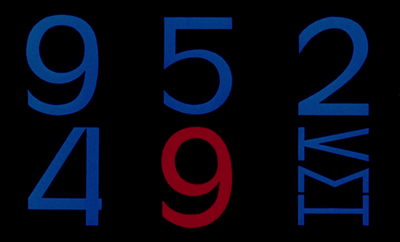 The '14H10' title covers in one second an ellipsis of five to ten seconds. 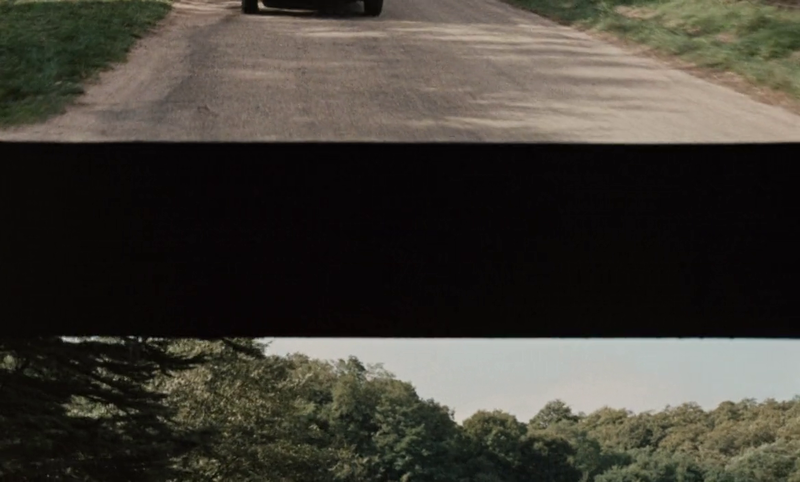 Whether it replaces frames removed from one continuous shot or disguises a transition to a new shot doesn't really matter. Either way, this sequence is broken by that title into two shots, the first lasting two minutes and forty seconds, the second lasting five minutes and ten seconds. 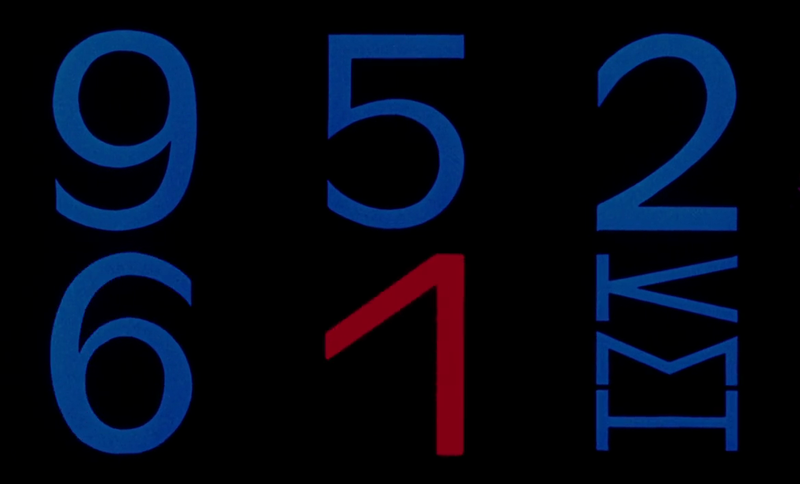 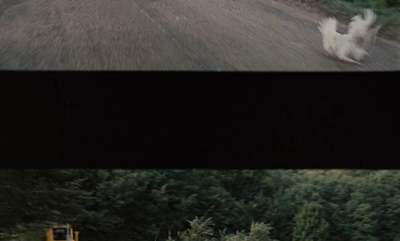 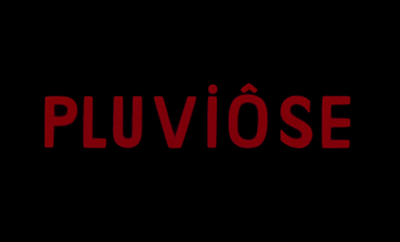 If, as I suspect, there is also an ellipsis covered by the '13H40' title, then the sequence comprises three shots, with a five-second shot between the two longer ones. 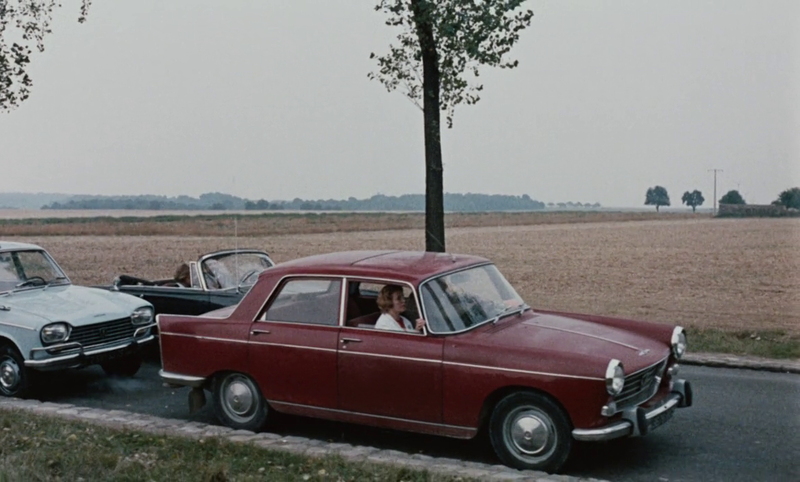 The couple set out to reach Oinville, though they never specify which of four possible places called Oinville they are heading for: Oinville-sur-Montcient (78), Oinville-Saint-Liphard (28), Oinville-sous-Anneau (28) or just plain Oinville (28), near Mainvilliers. 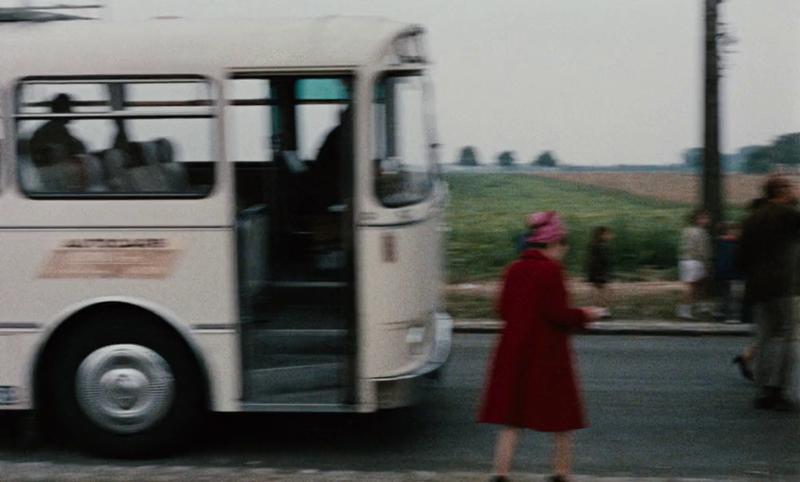 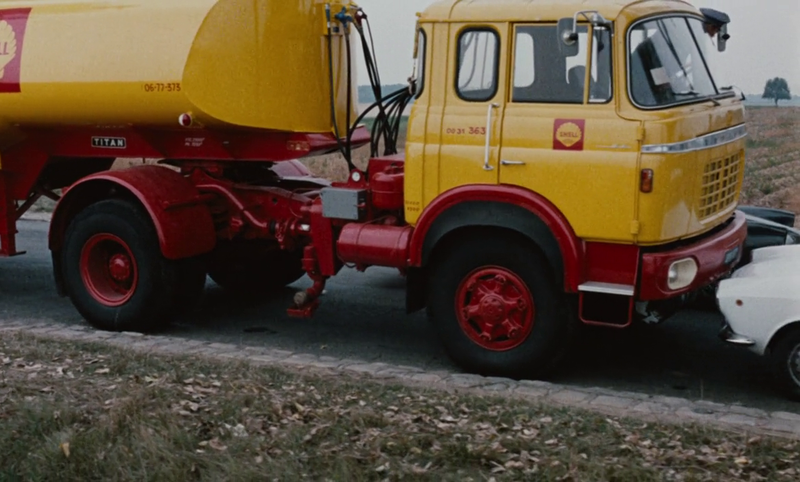 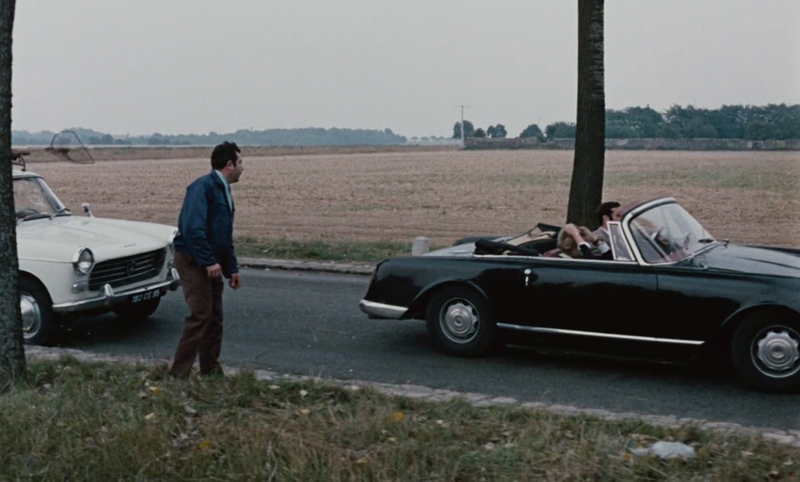 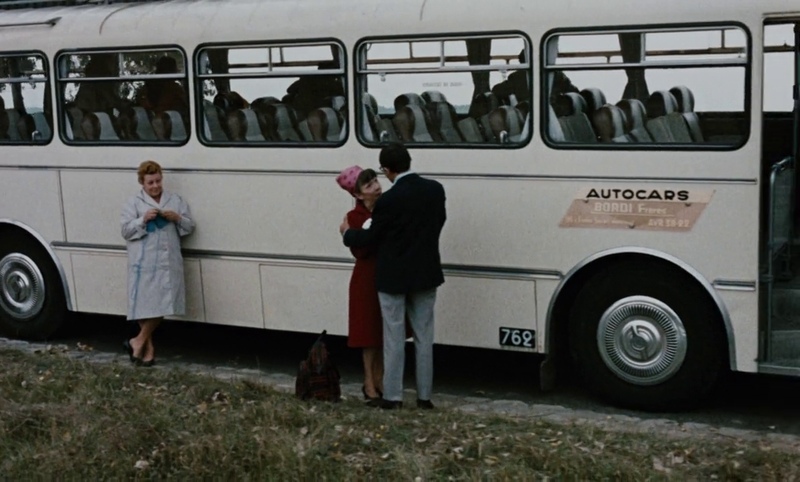 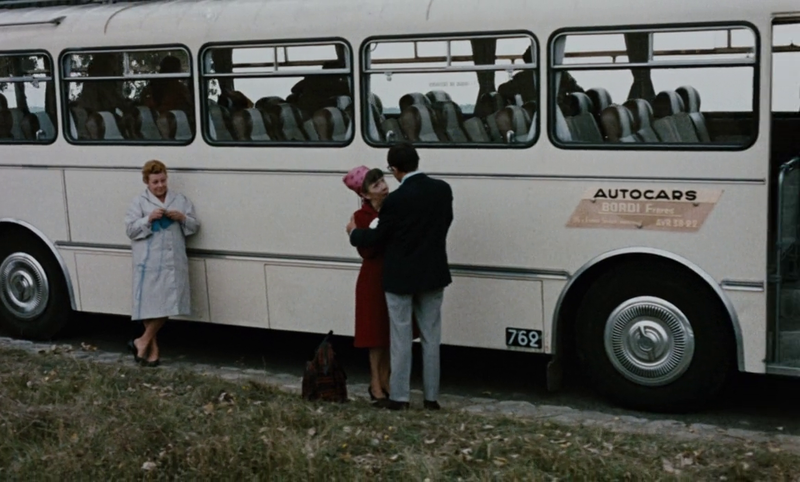 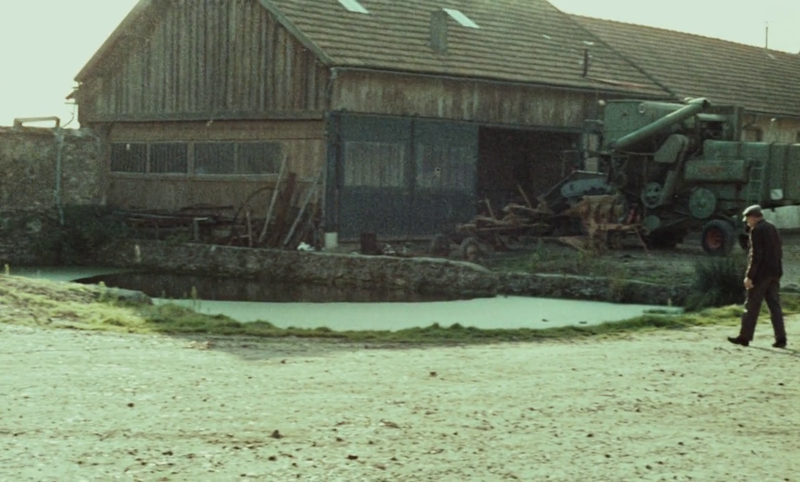 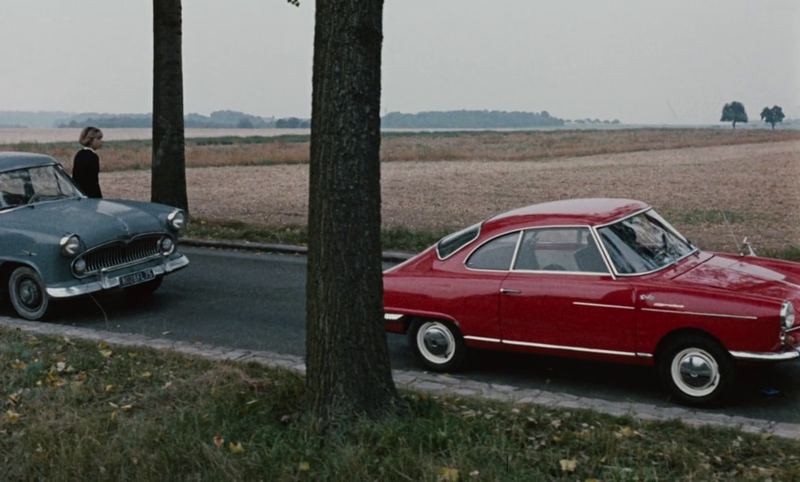 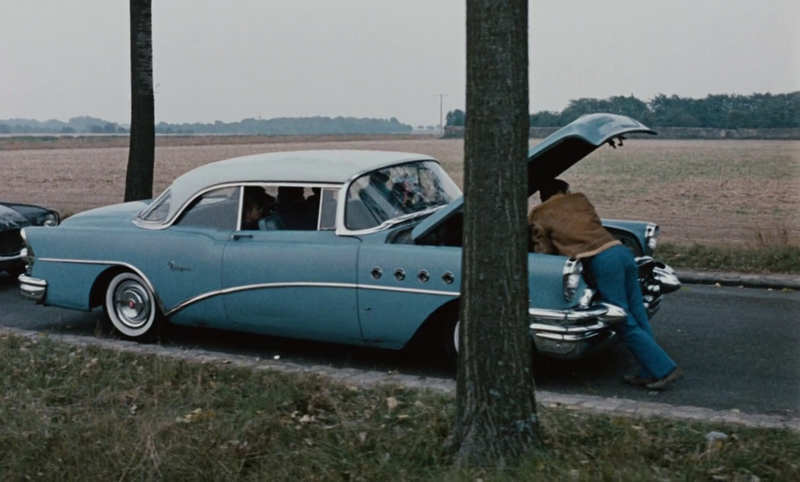 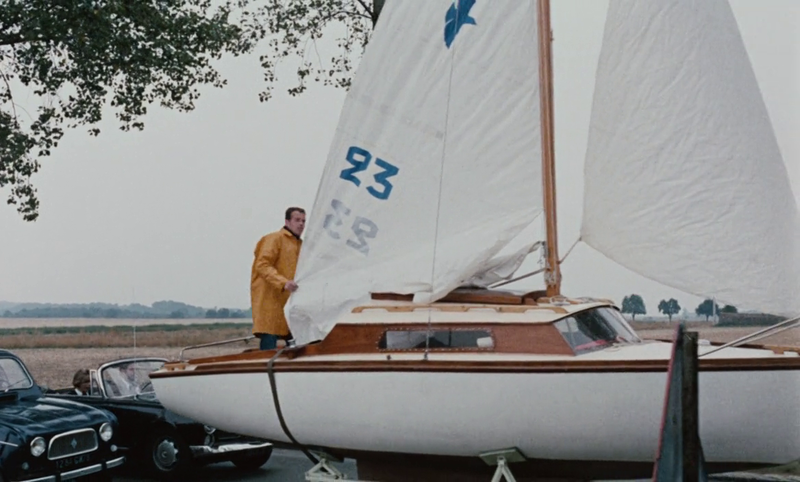 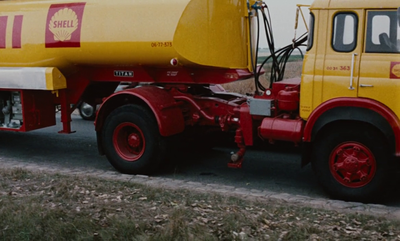 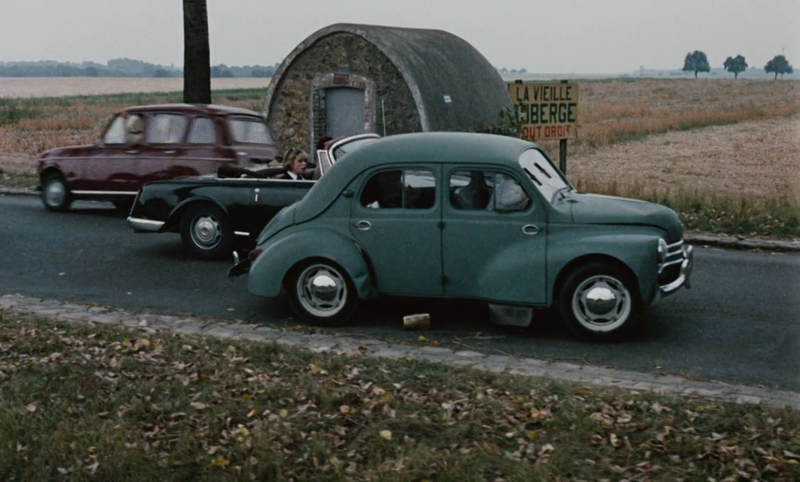 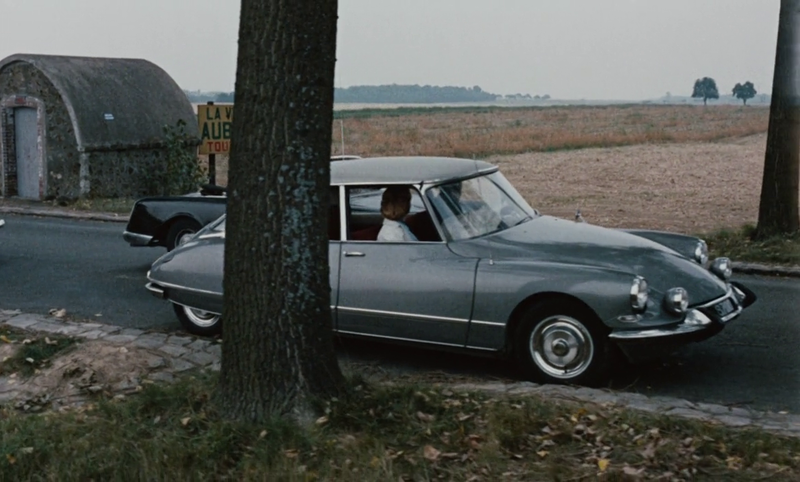 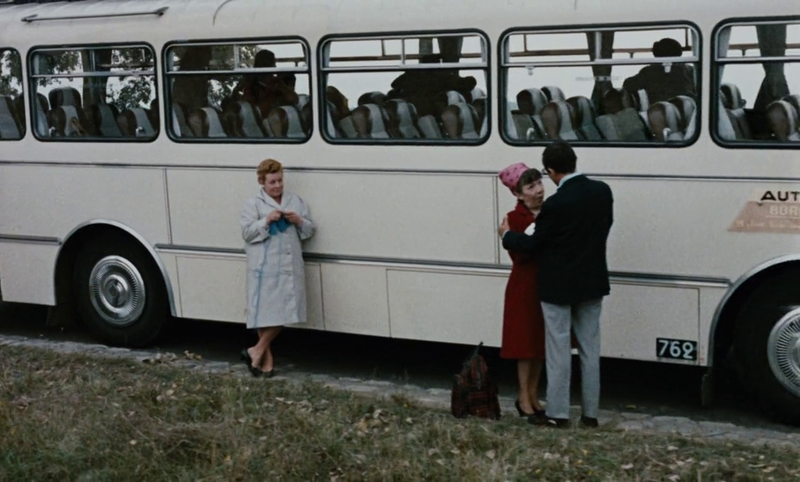 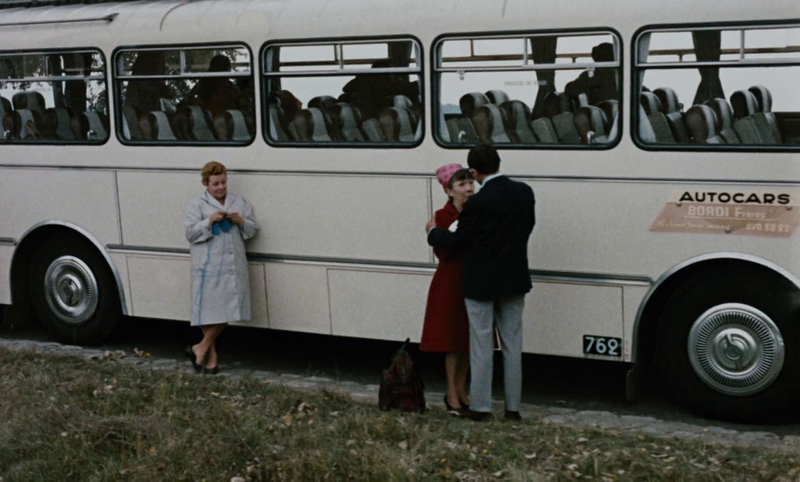 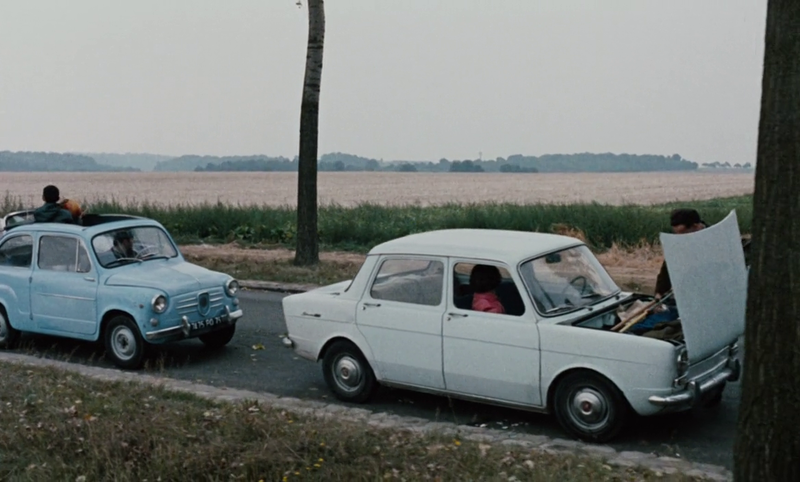 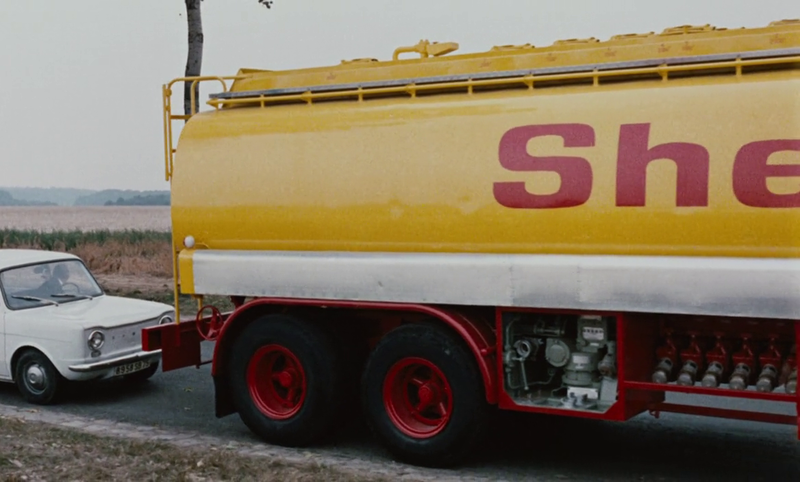 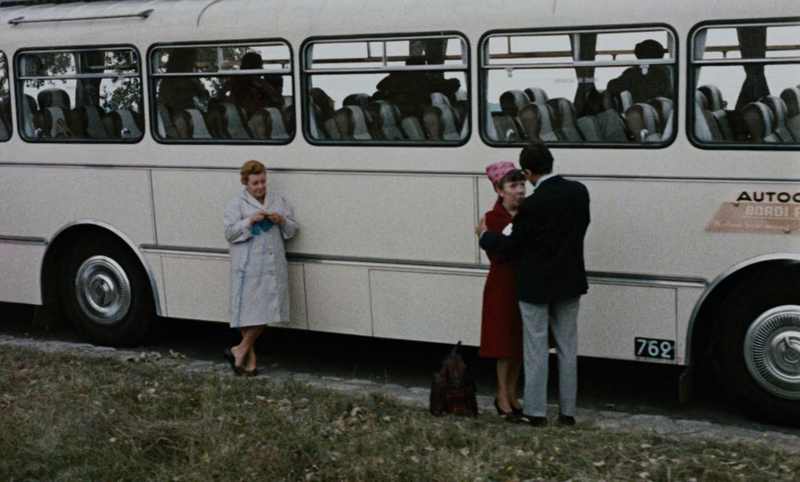 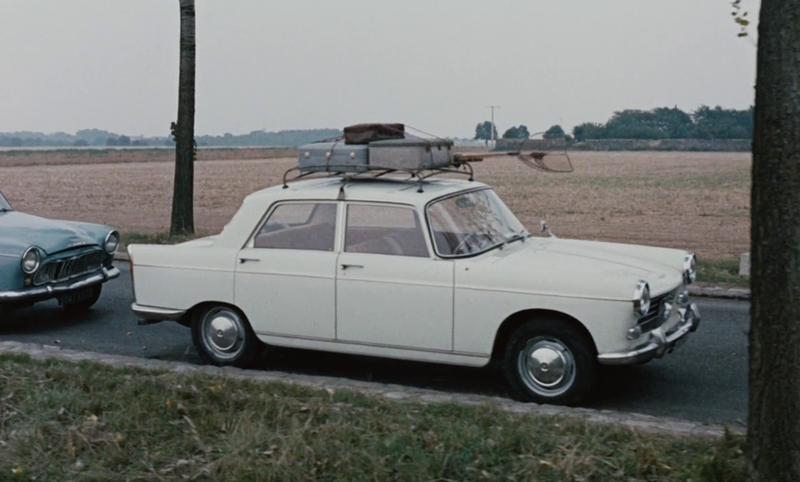 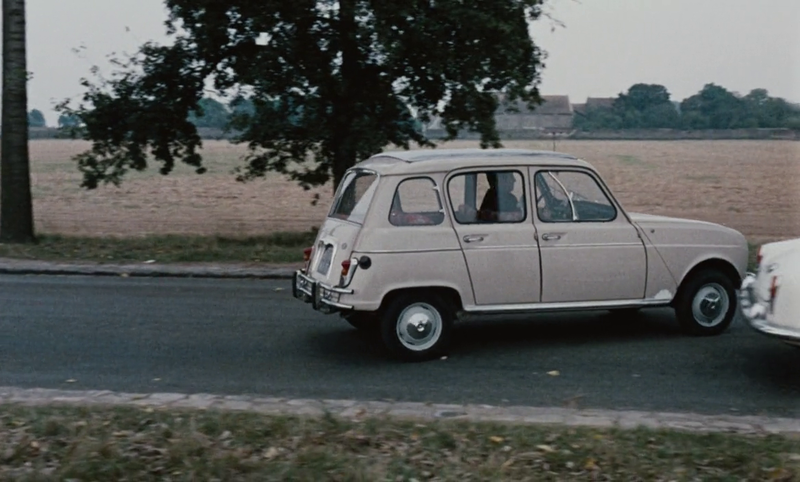 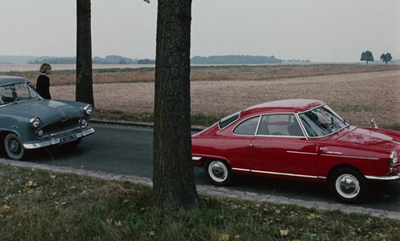 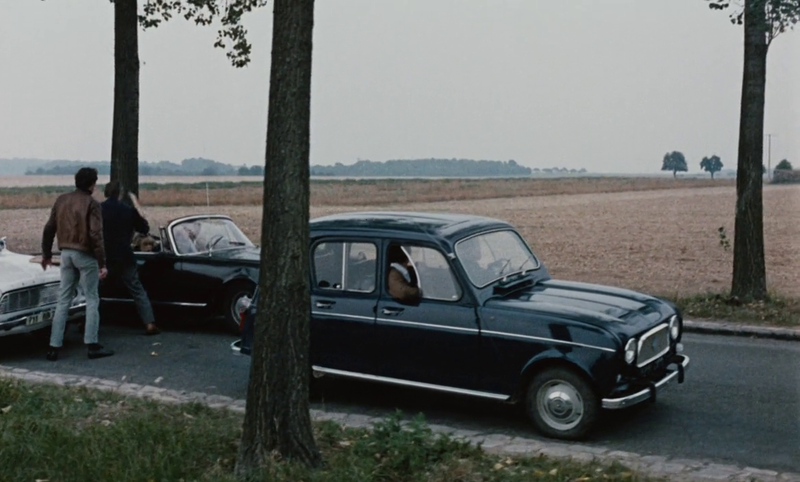 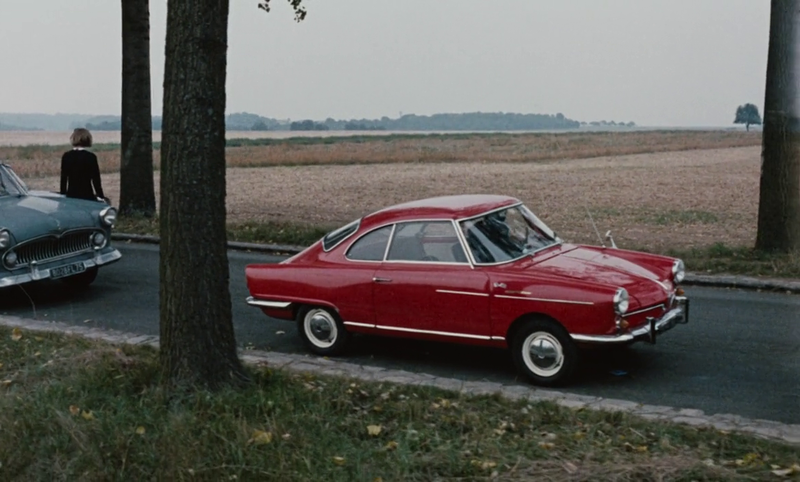 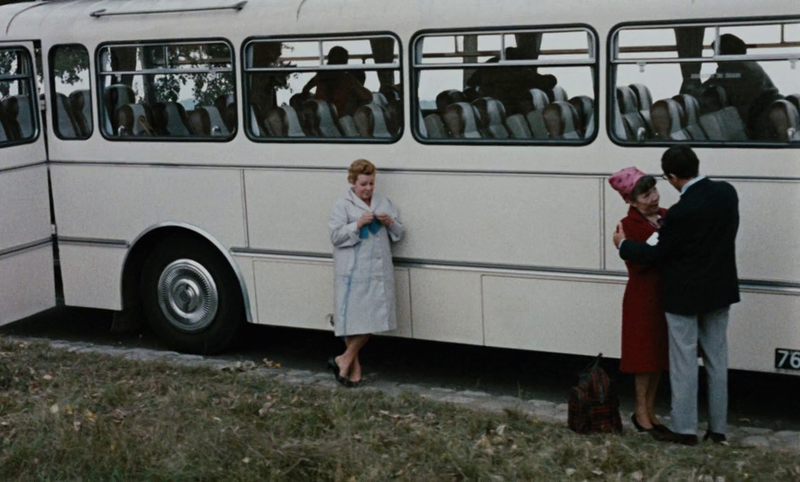 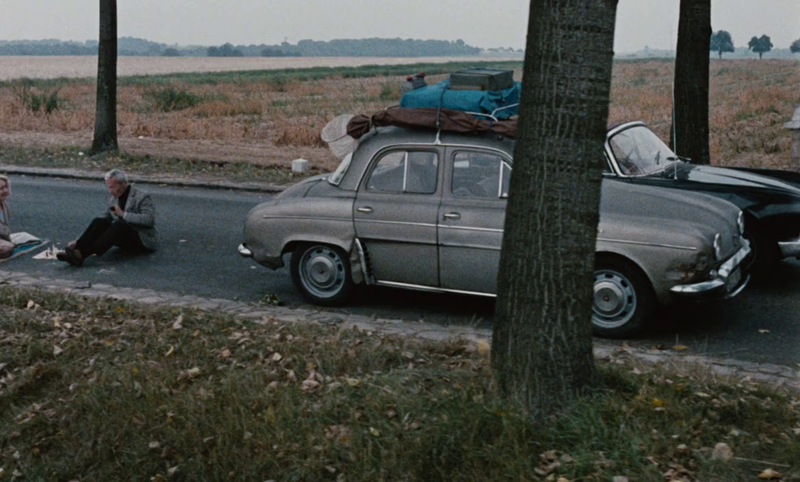 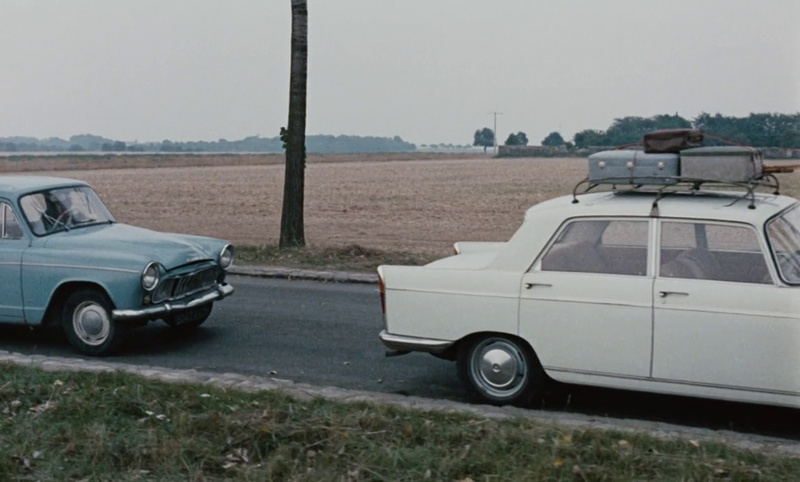 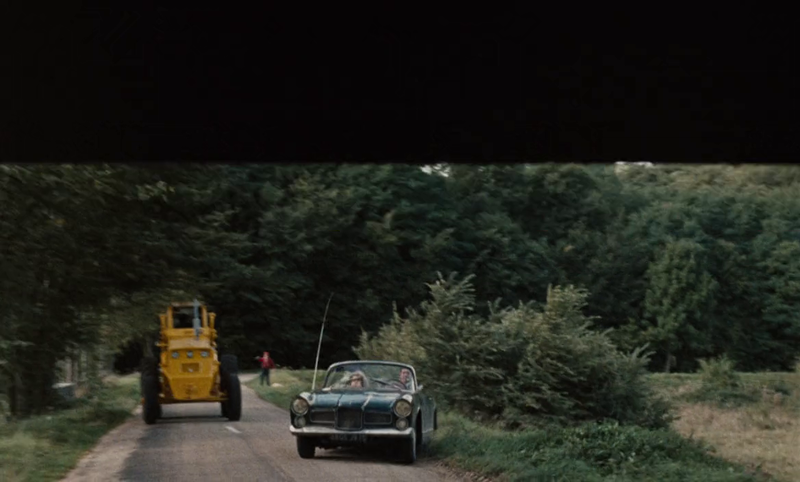 Baecque (Godard p.387) decides that it must be the first of these, and furthermore affirms that Godard shot 'the longest tracking shot in the history of cinema … on the D913, leading from Meulan to Vétheuil, and more exactly near Oinville-sur-Montcient, the sign for which we see in the film'. 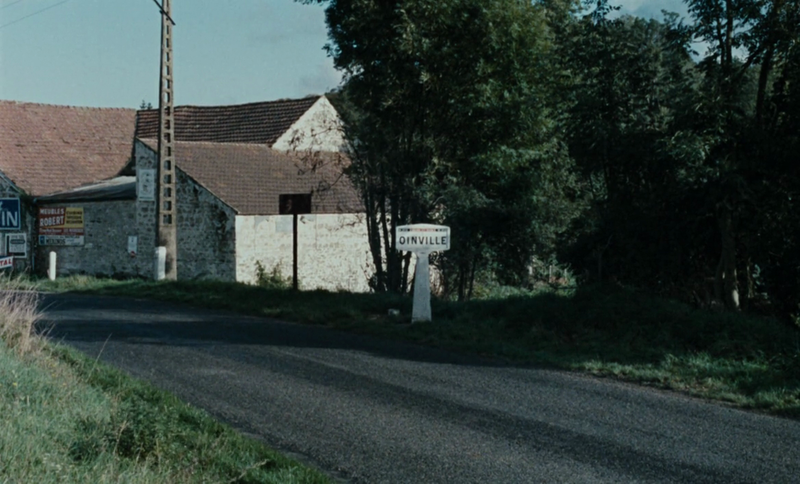 However, - as you can see above - the sign we see only reads 'Oinville'. 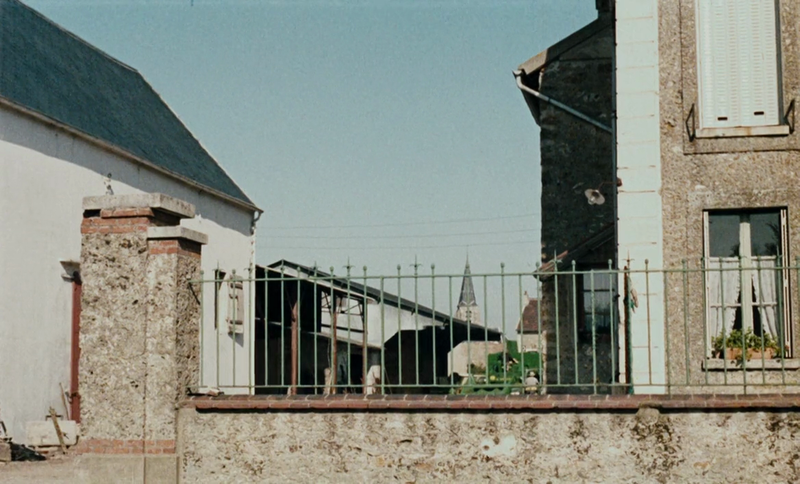 We can also see, I think, that this is not an authentic sign - the name Oinville has been stuck onto a sign at the entrance of some other village. 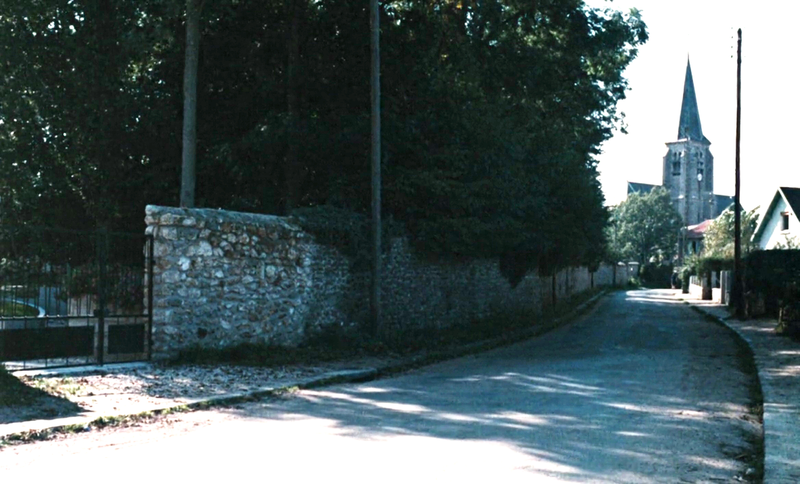 I don't know on what basis Baecque came up with this precise but completely different location for where the sequence was filmed: 'along the tree-lined departmental route D913 leading from Meulan to Véthueil, and more exactly near Oinville-sur-Montcient'. 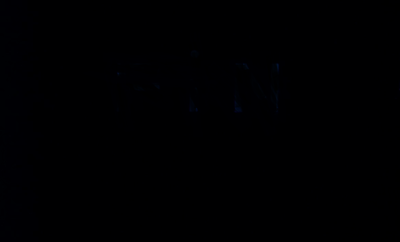 It is understandable that he not know something, but incomprehensible that he would then invent information to cover his ignorance (though I have found him making up false quotes before - see at the end of the post here - so perhaps I shouldn't be surprised). 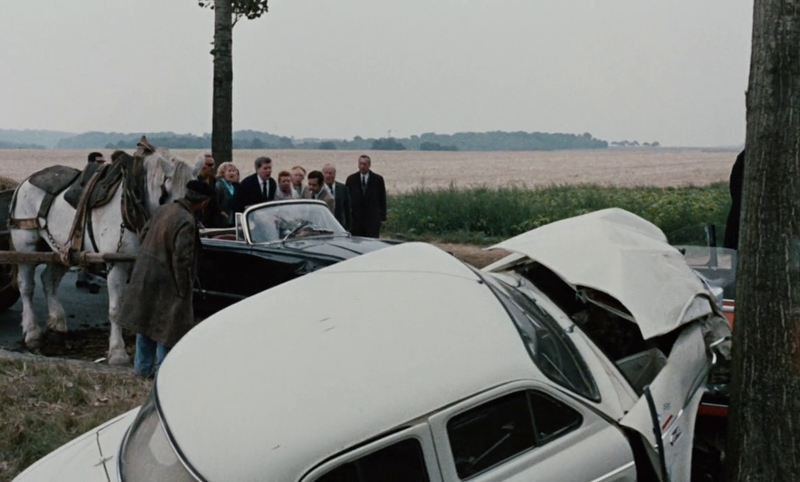 This is an accident from the following sequence, which has nothing to do with the traffic jam and the roadside tracking shot. As I constantly have to say to my students: every piece of information in books by Baecque needs to be checked. 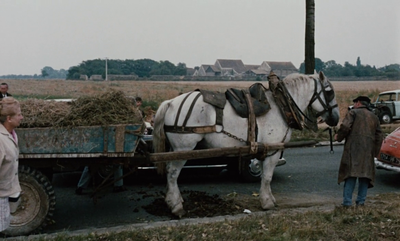 He is a consistently unreliable and lazy writer, and a poor scholar. 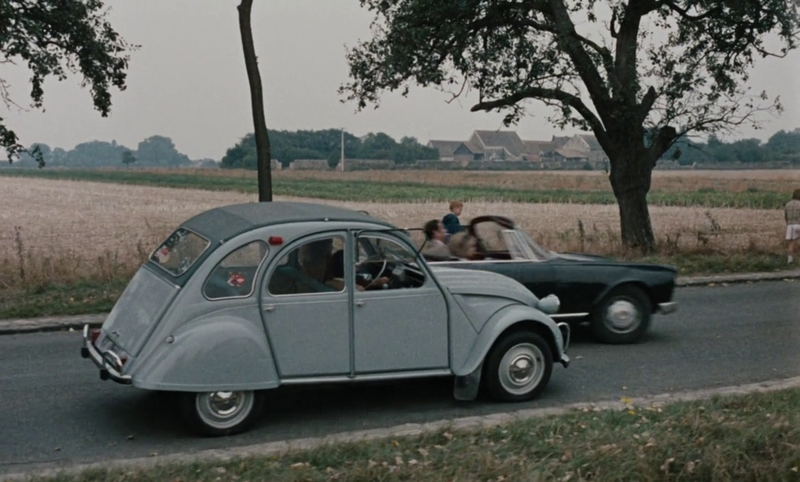 I still have some work to do on the places of Week End, but I can say already the protagonists' trek across France doesn't actually take them very far. The traffic jam was on a road leading from Guyancourt, a town just south of Versailles. 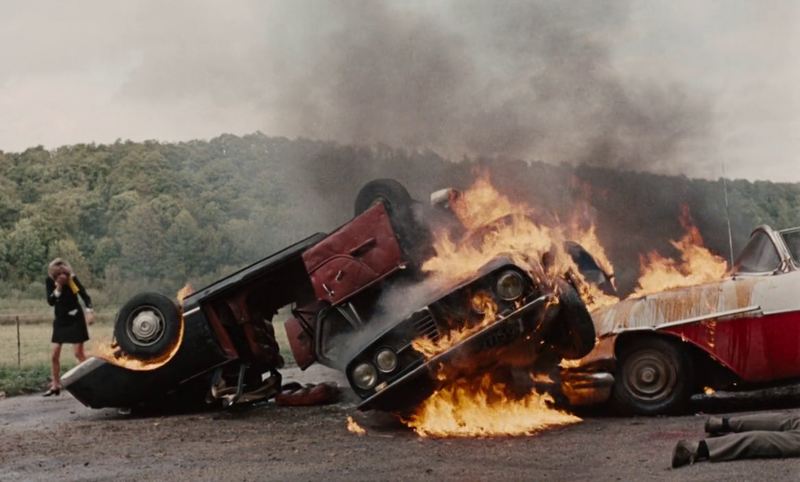 When they are taken prisoner by Joseph Balsamo, they drive back down the same stretch of road on which was filmed the traffic jam. 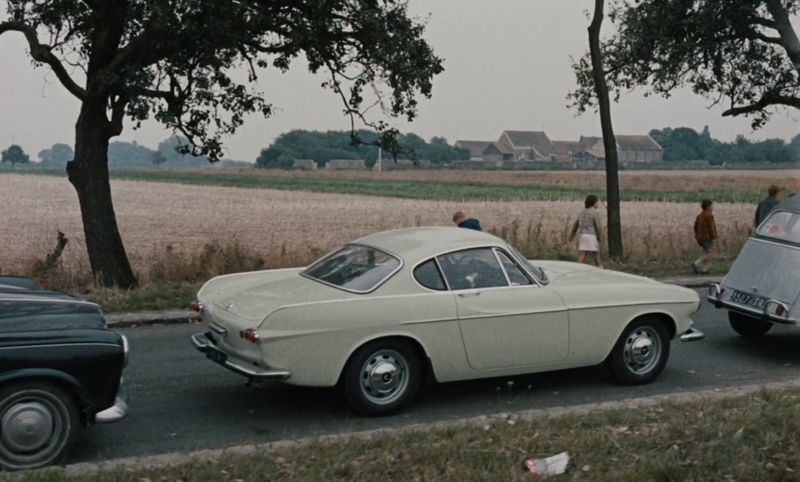 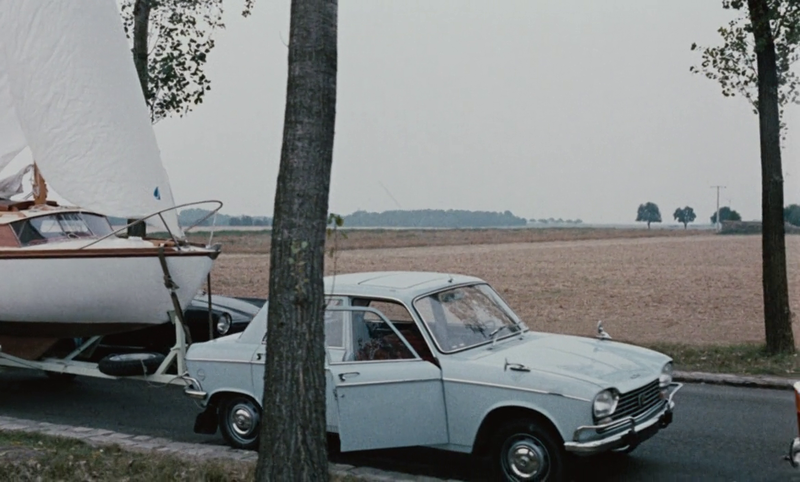 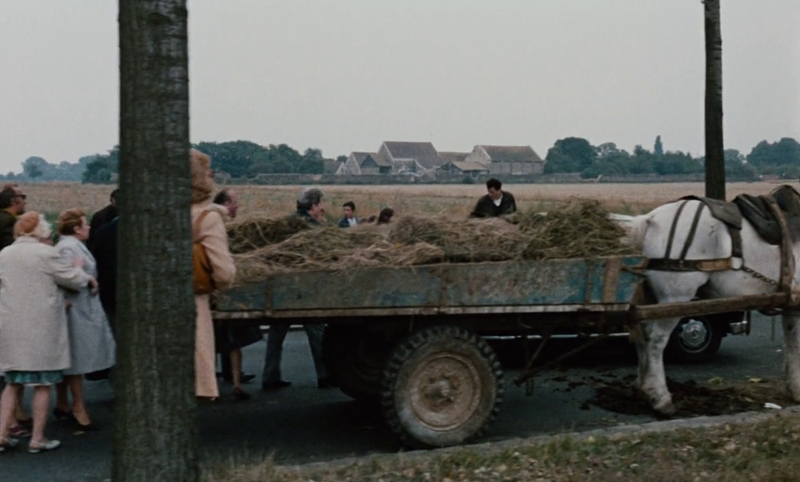 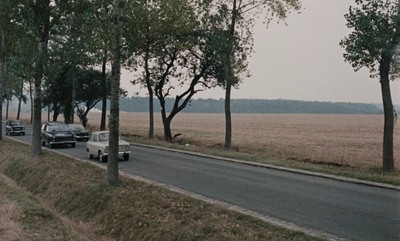 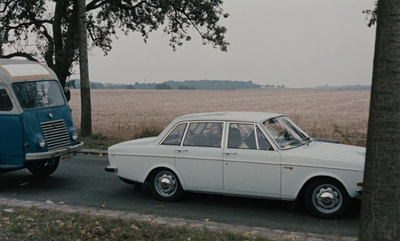 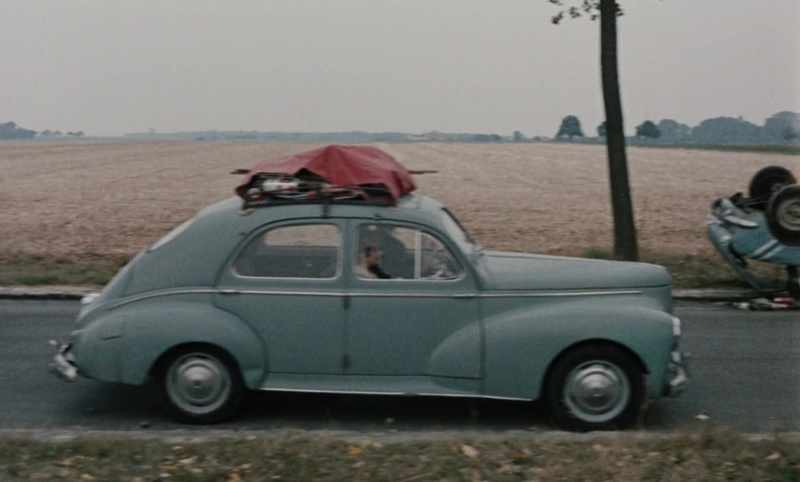 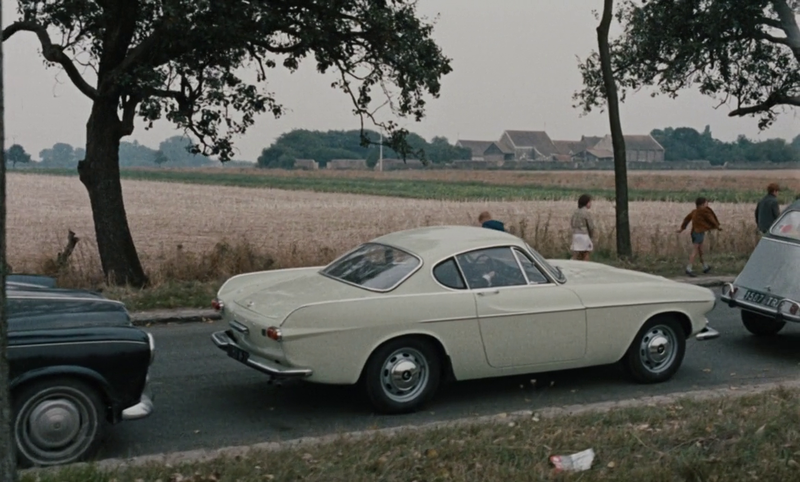 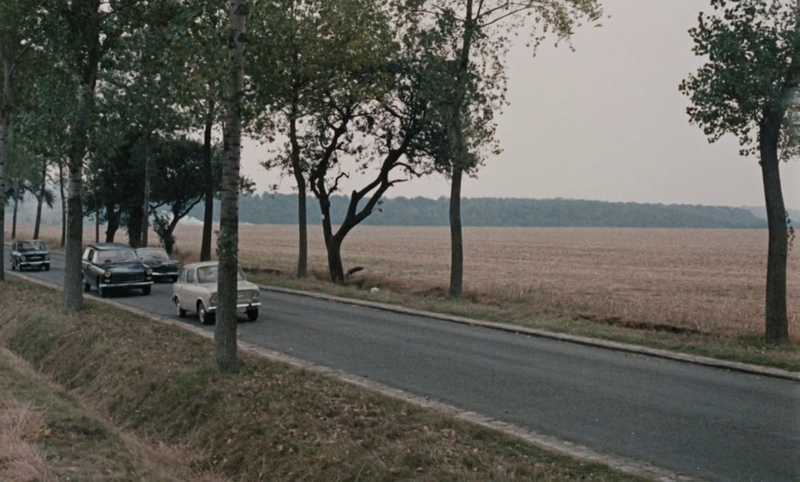 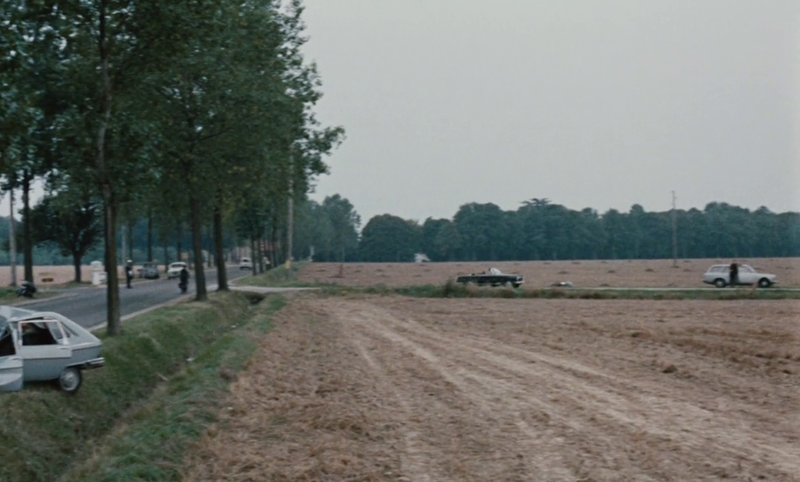 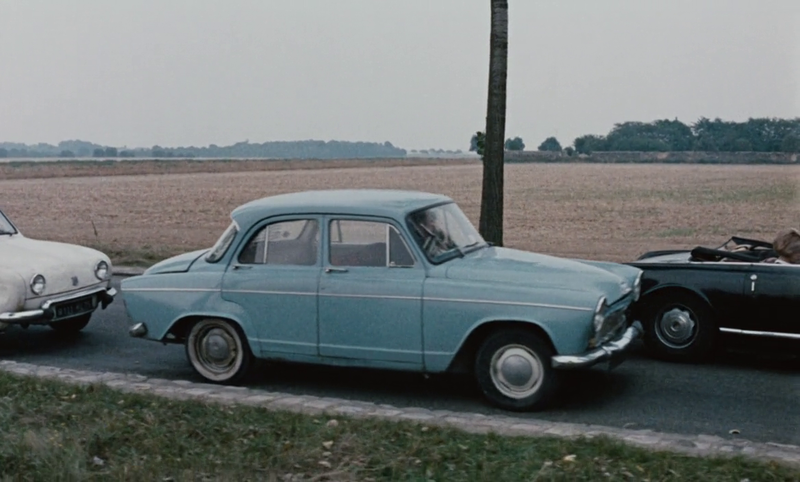 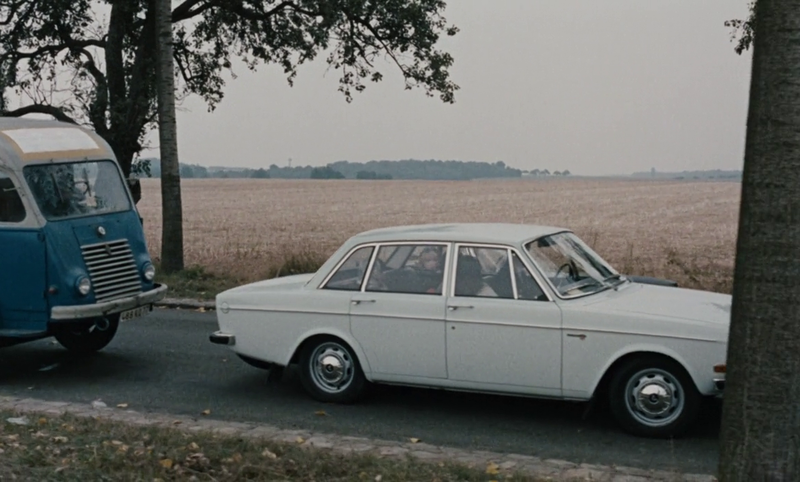 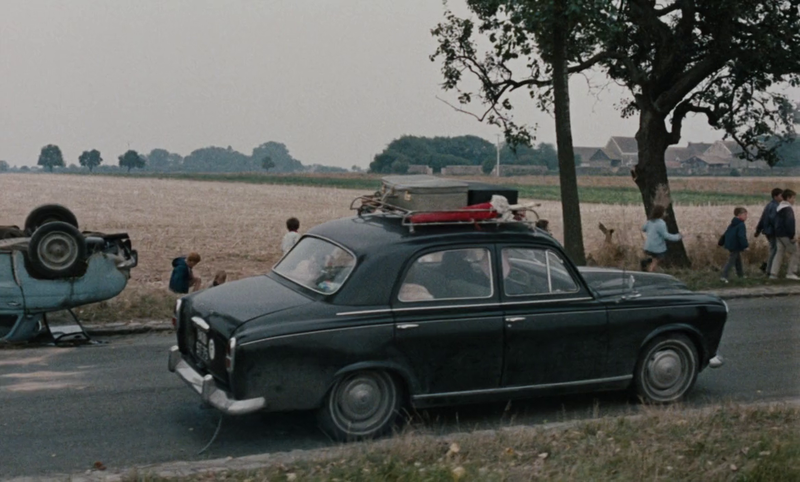 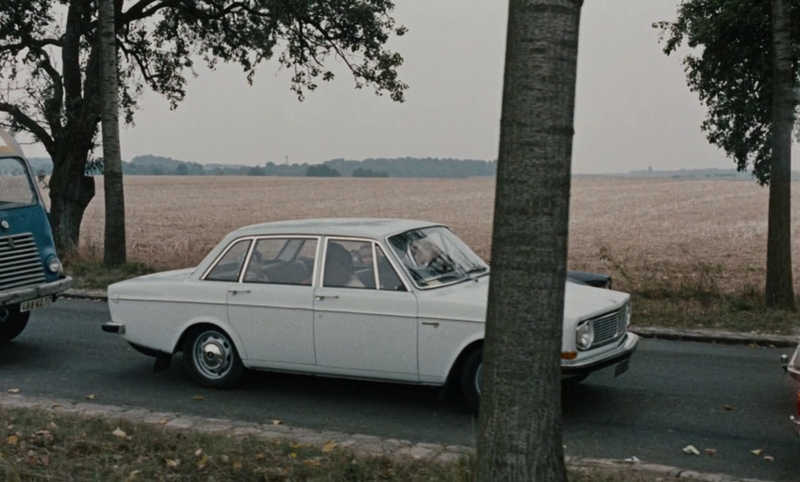 My guess is that all of the unidentified places in the film - roads, houses, forests, lakes, fields - are somewhere near Guyancourt, which seems to have served as a hub for the film's location hunter, Claude Miller. 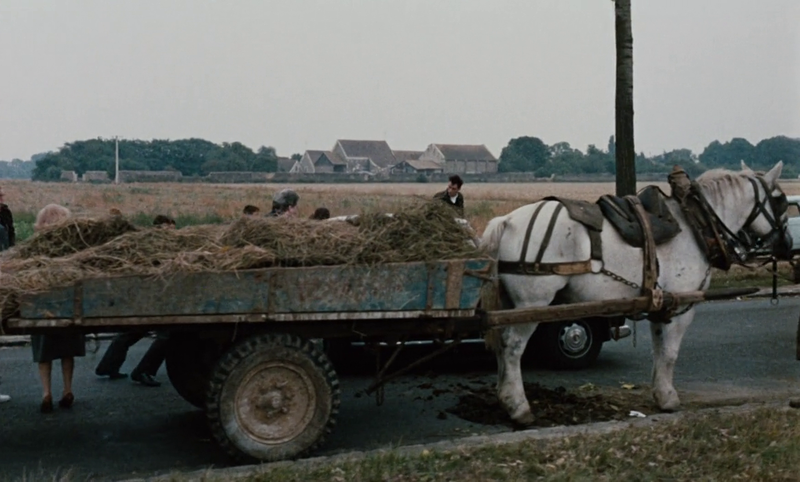 Miller is a link with Guyancourt's other claim to a place in cinema history, as a location for Robert Bresson's 1966 film Au hasard Balthazar, on which Miller was an assistant. 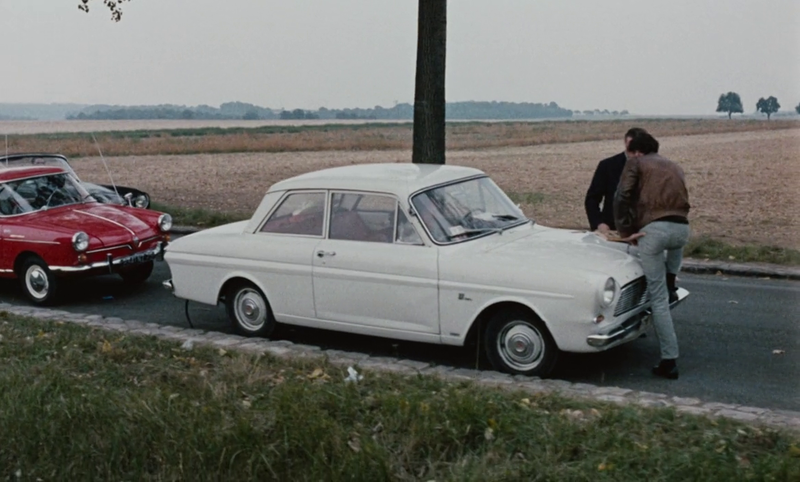 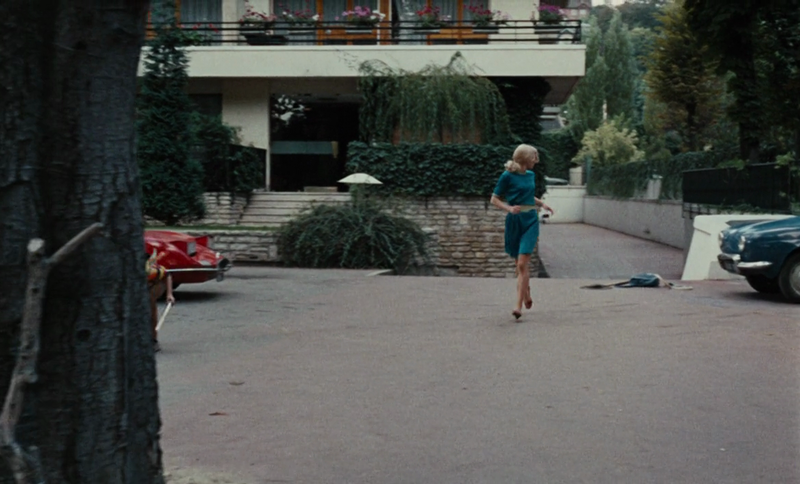 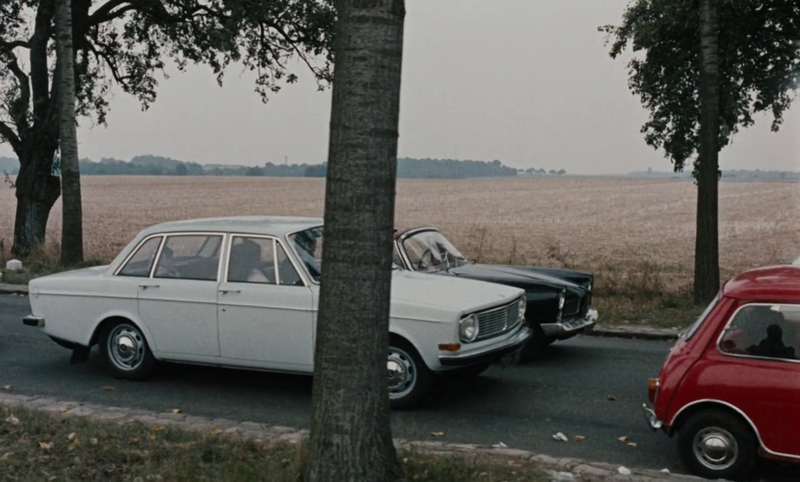 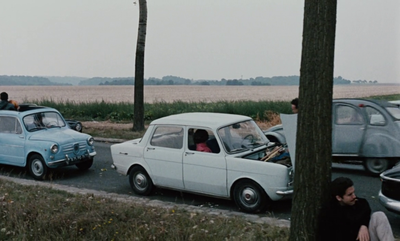 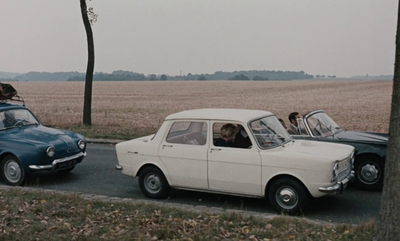 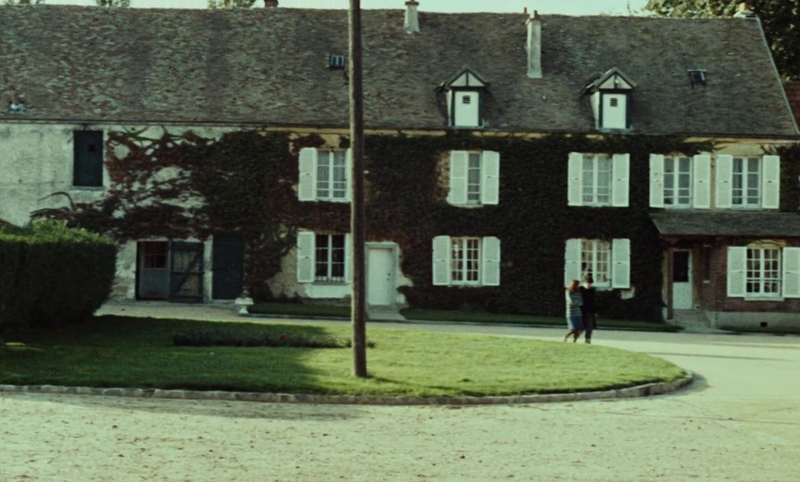 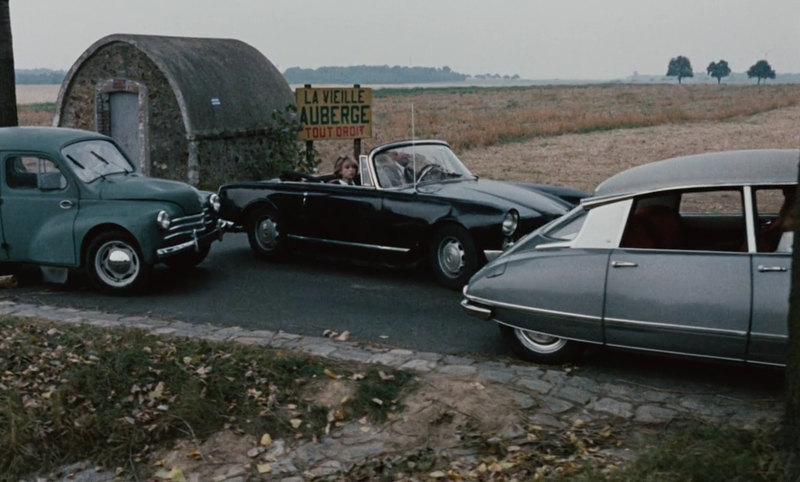 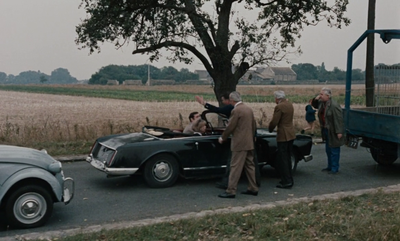 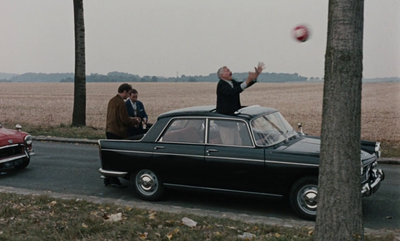 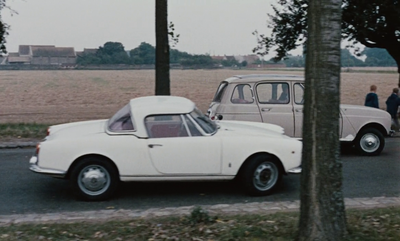 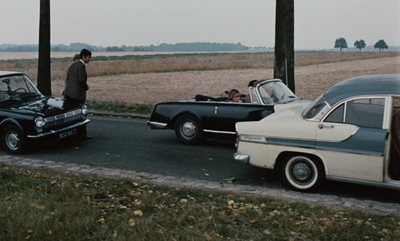 Guyancourt is where Godard first met Anne Wiazemsky, on the set of Bresson's film. 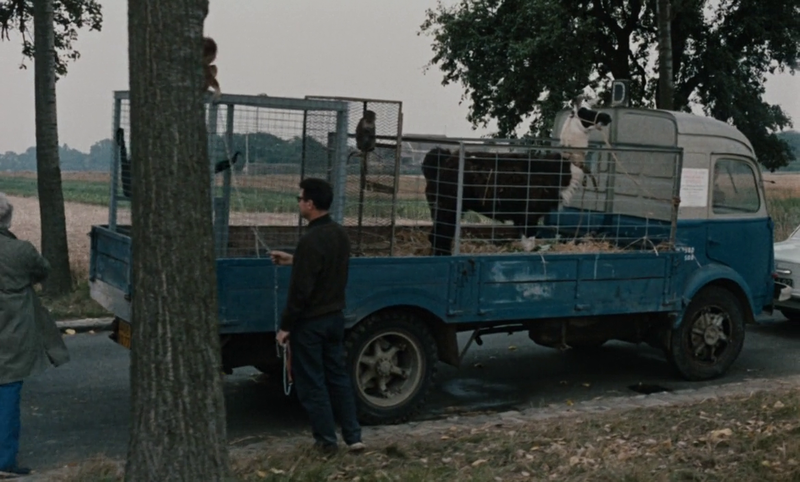 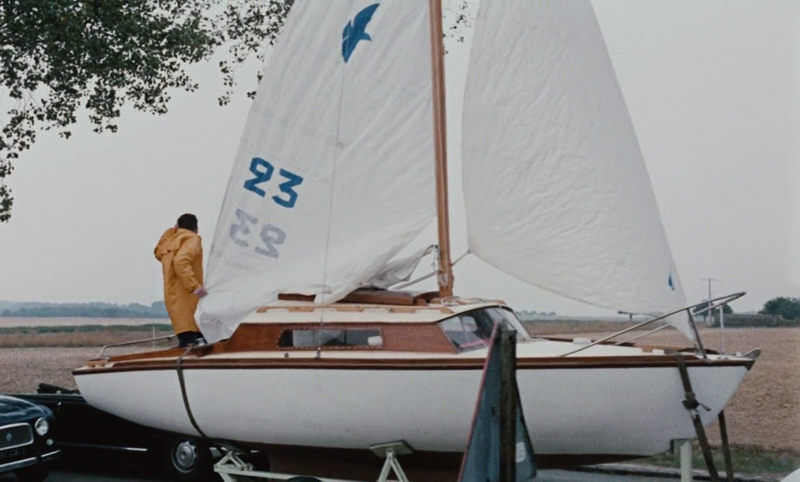 I haven't matched any locations from the two films, but there are two or three details in Week End that look like they might be echoes of Au hasard Balthazar. 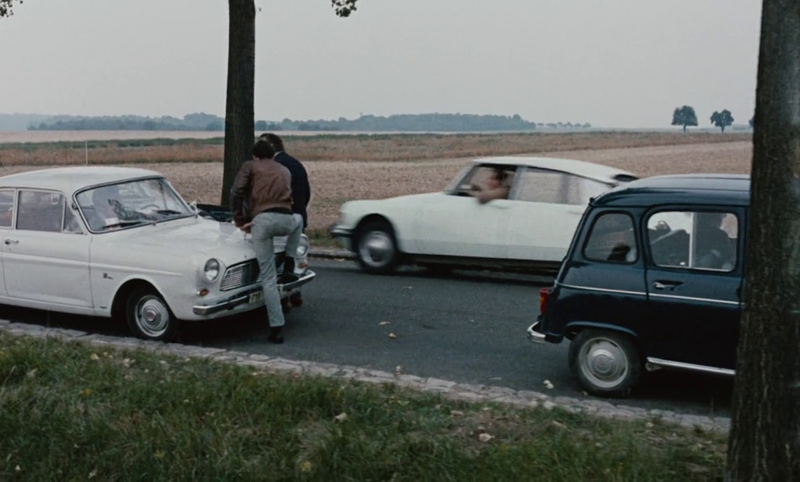 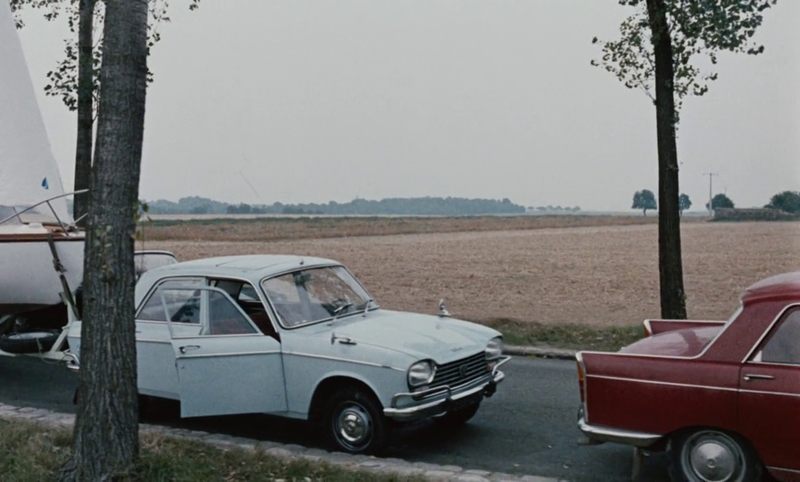 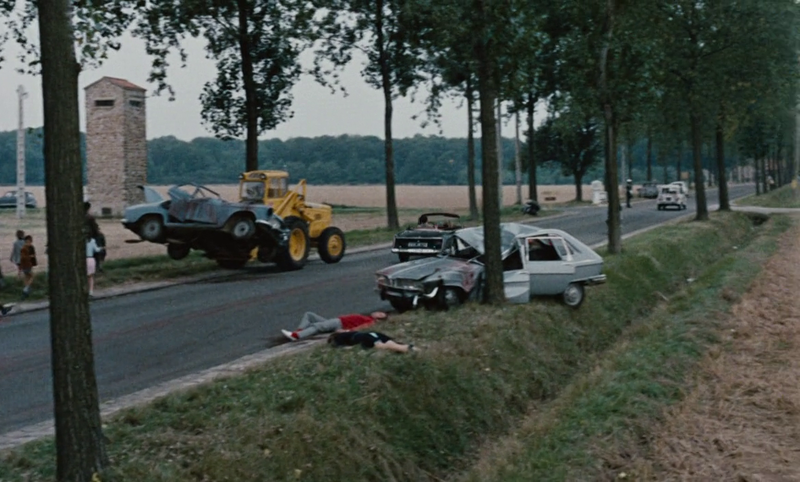 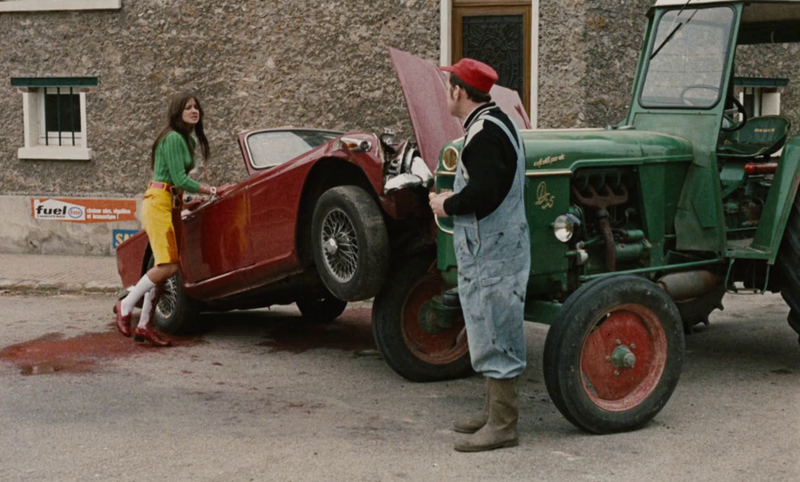 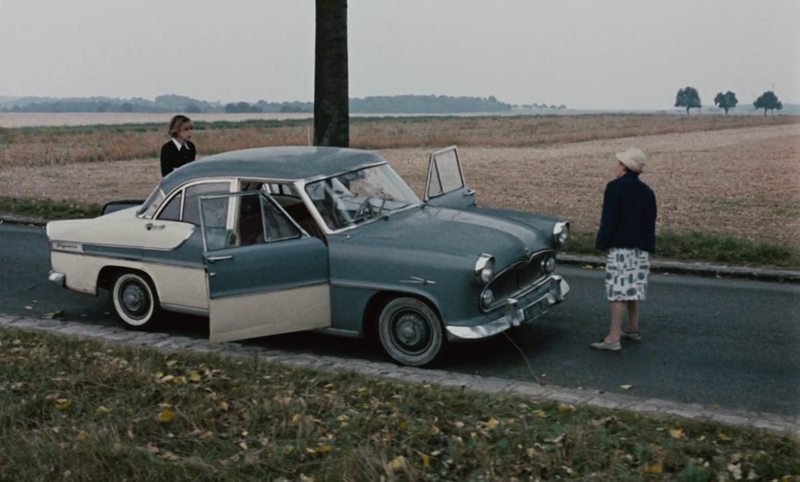 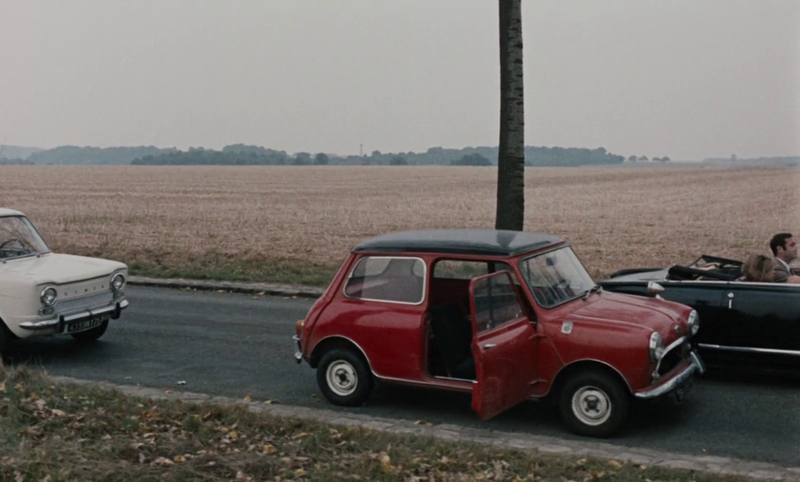 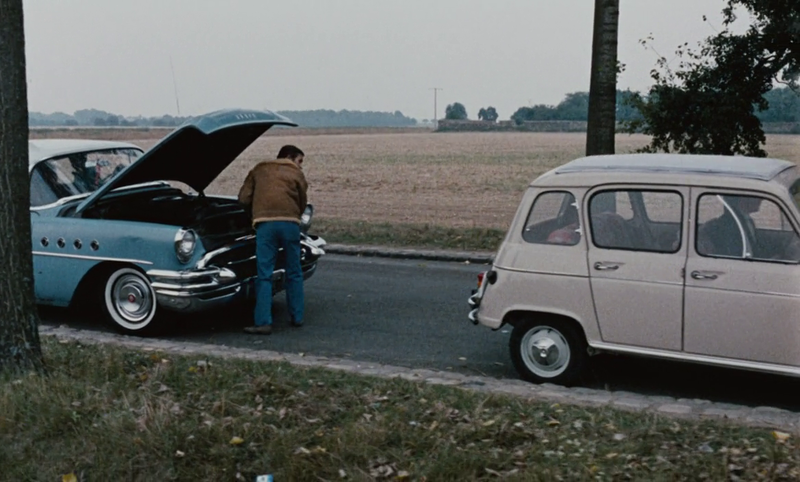 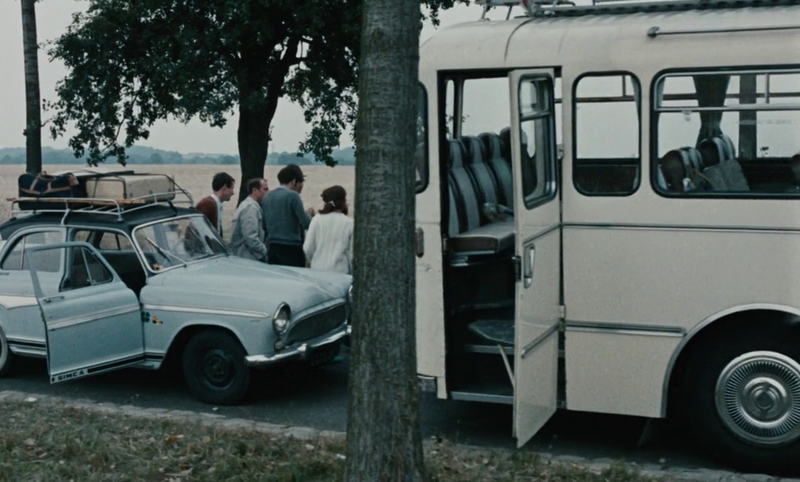 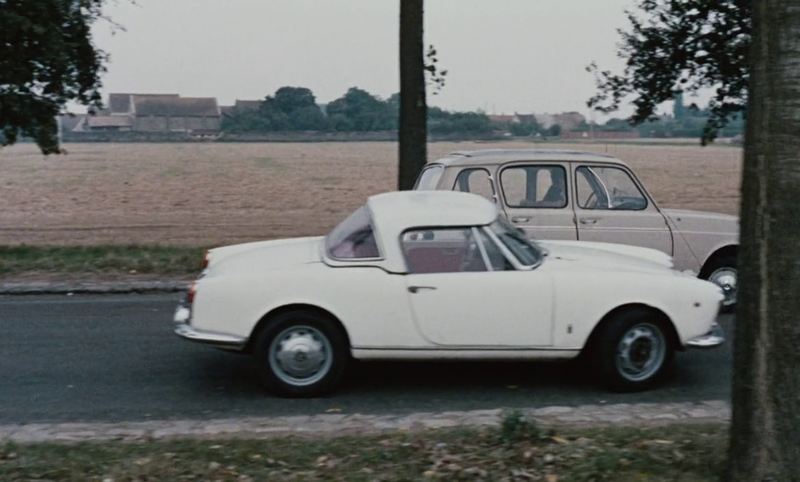 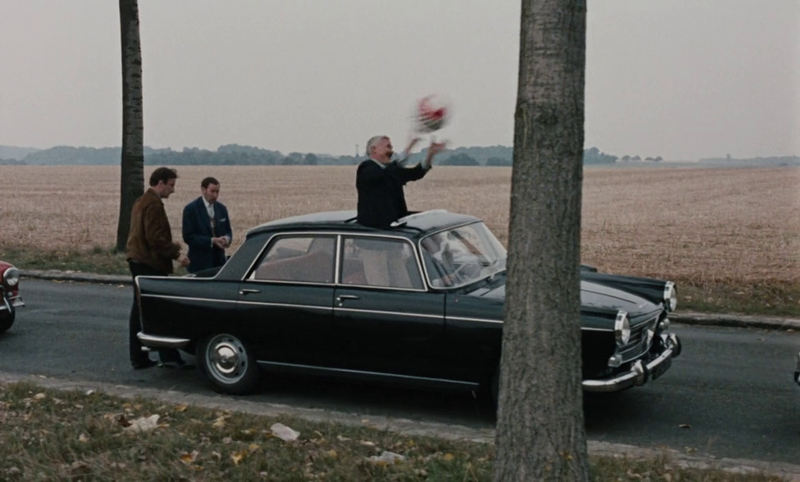 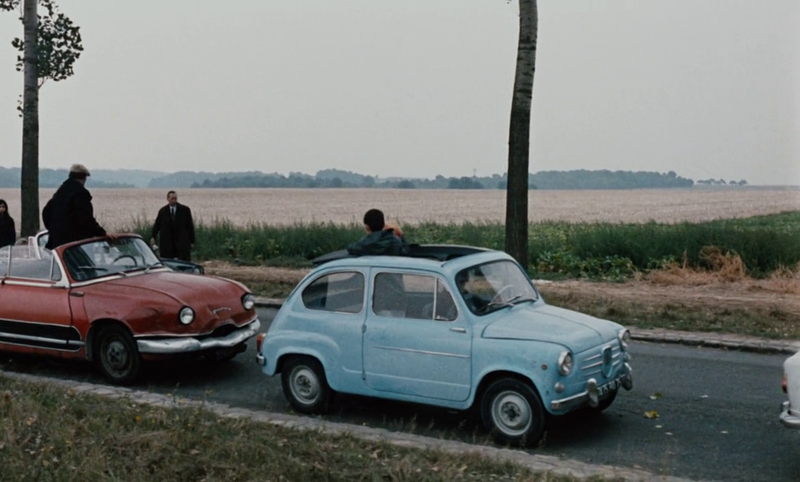 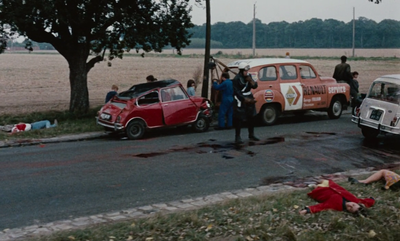 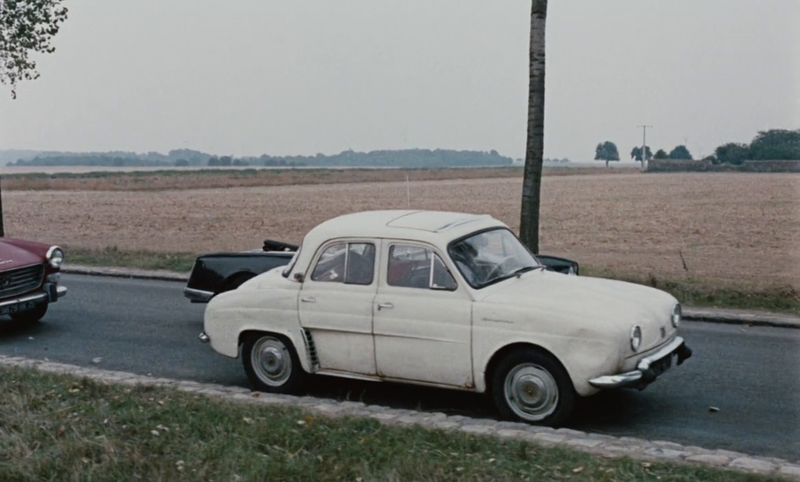 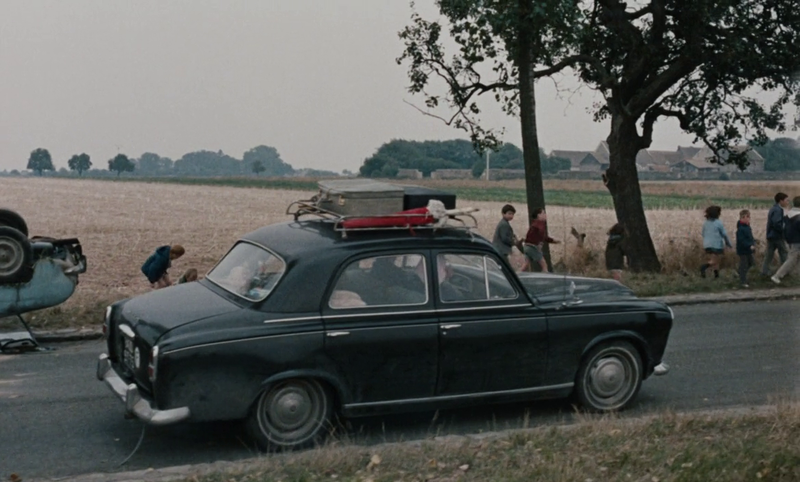 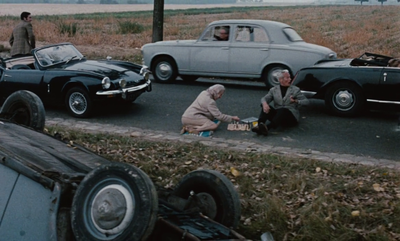 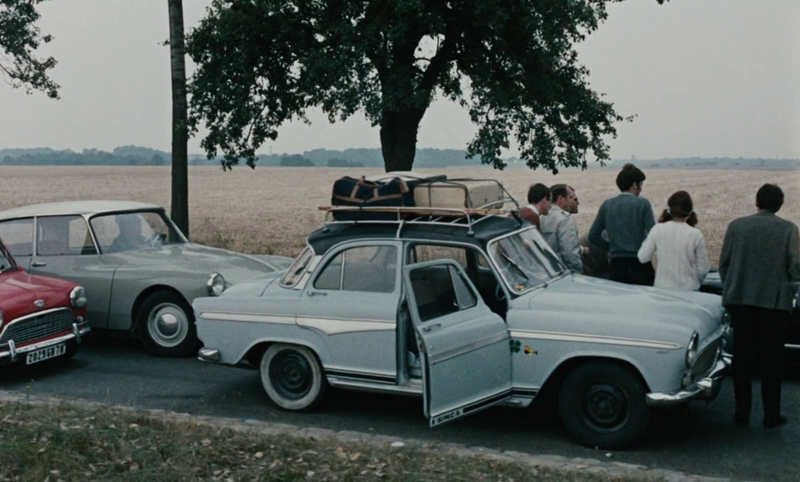 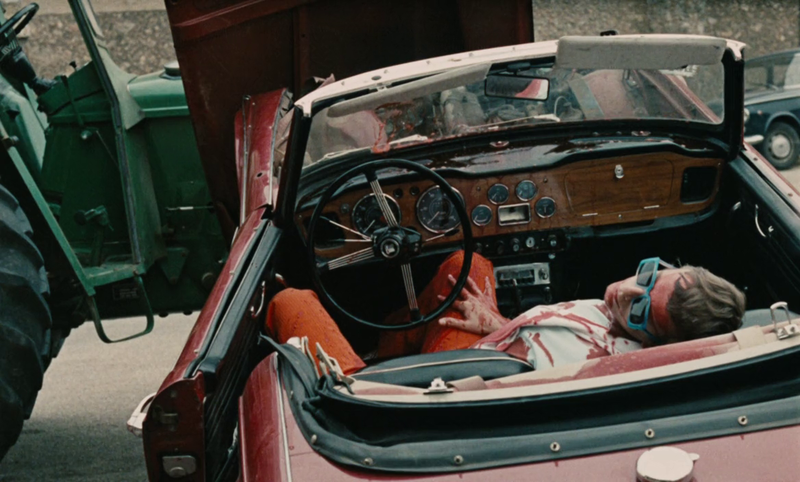 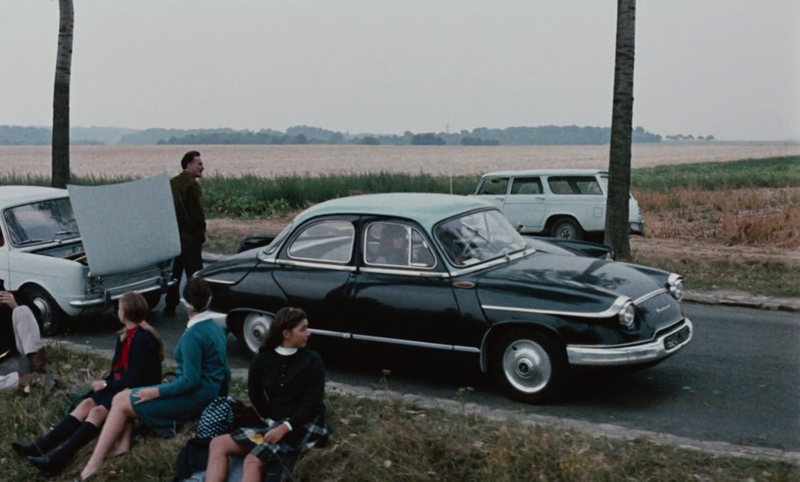 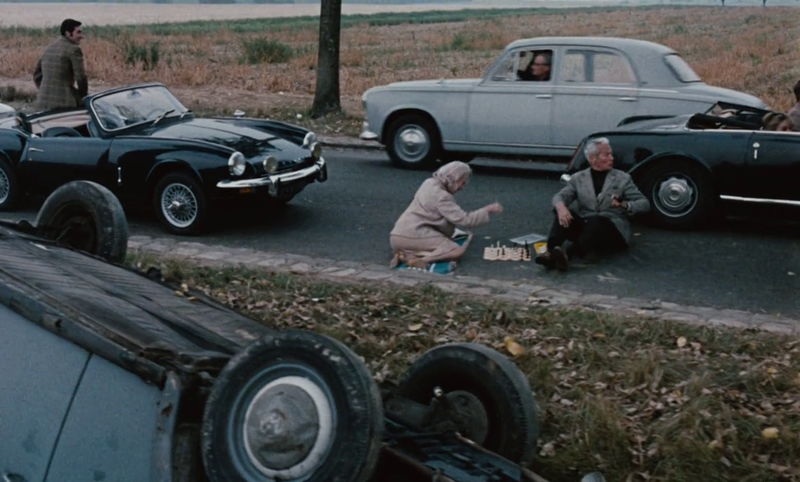 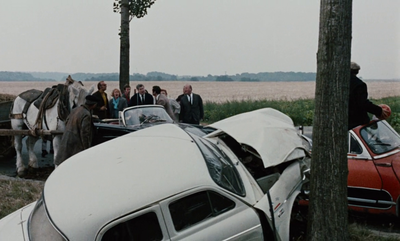 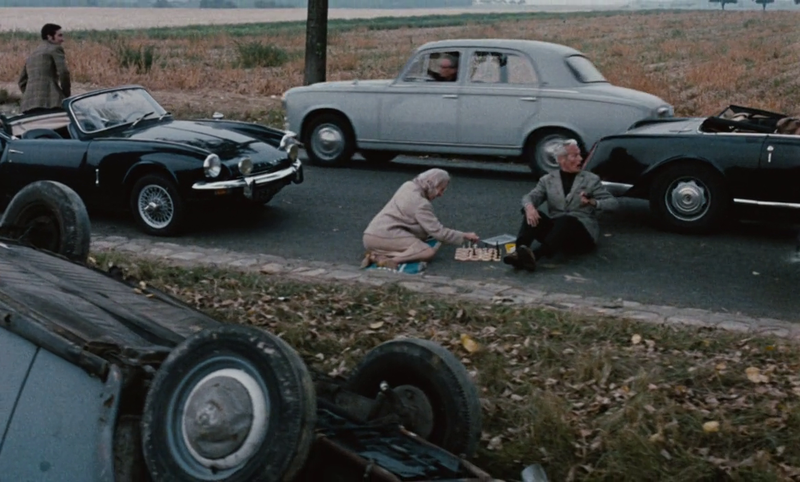 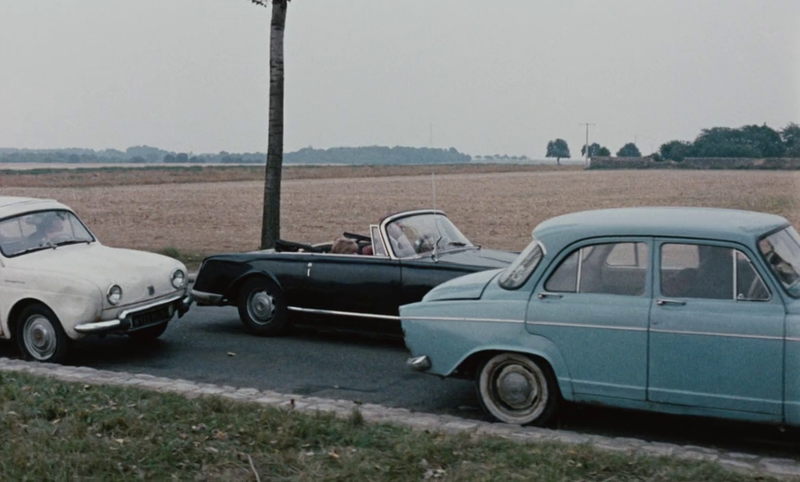 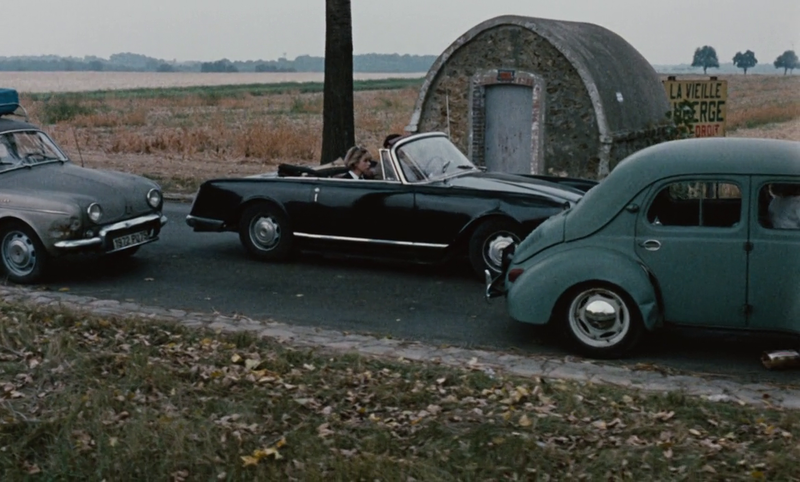 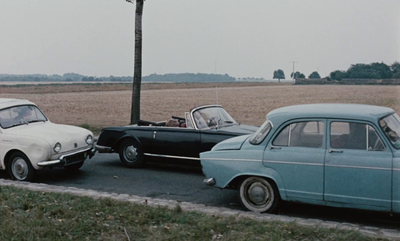 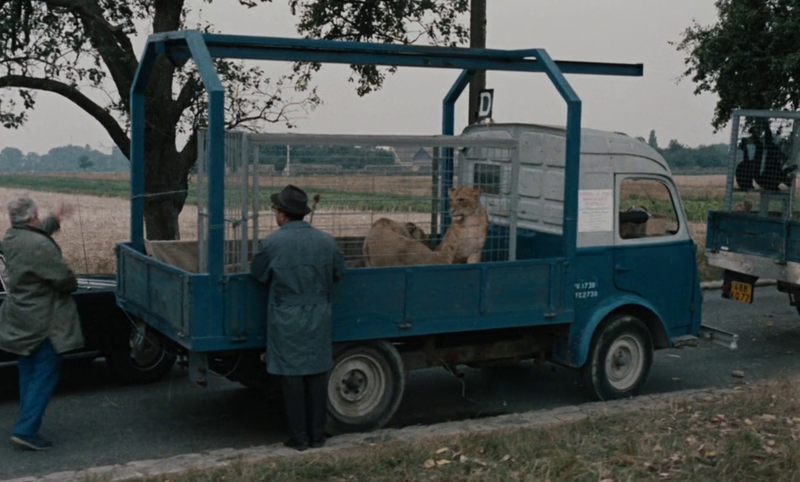 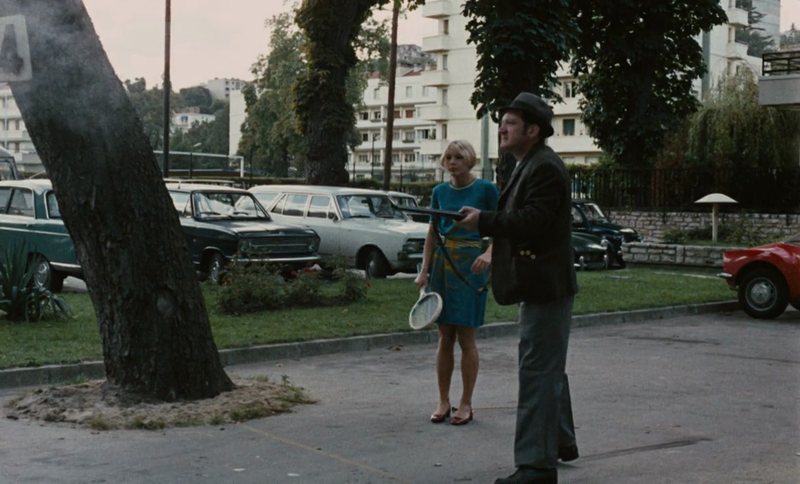 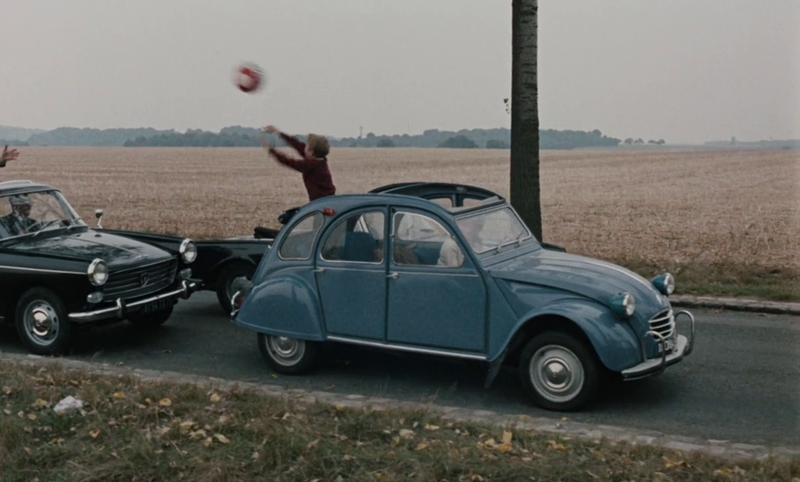 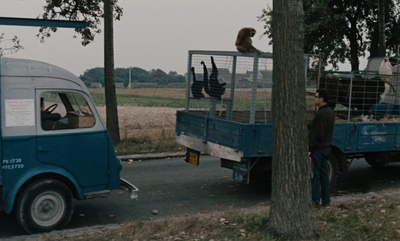 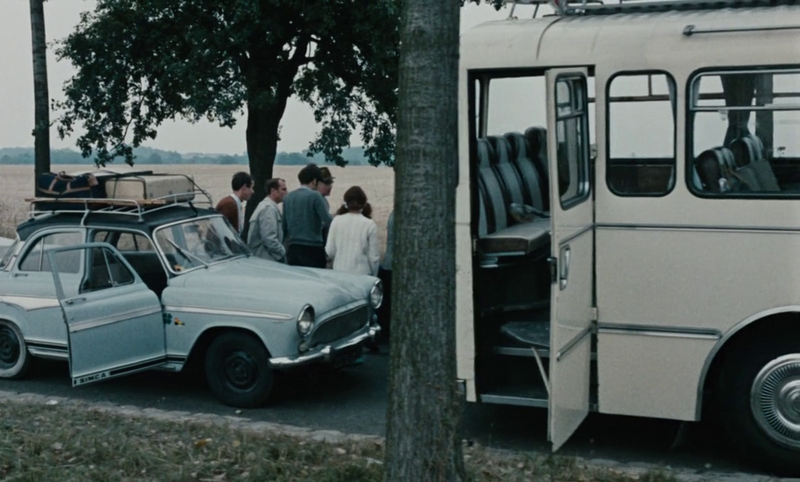 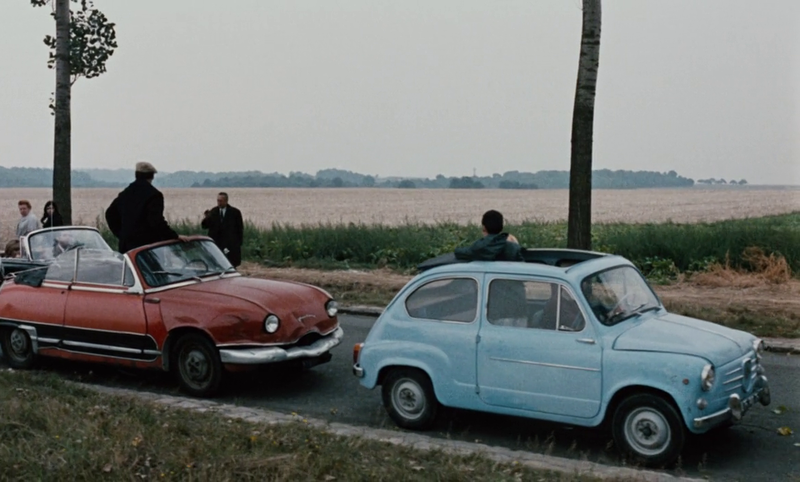 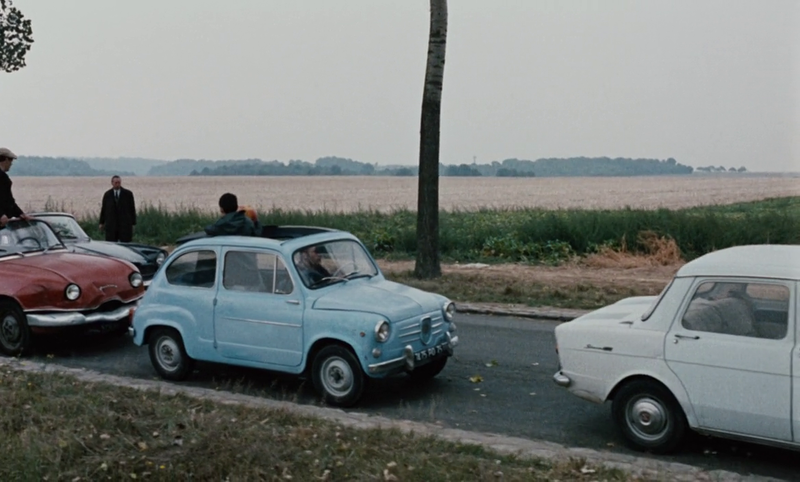 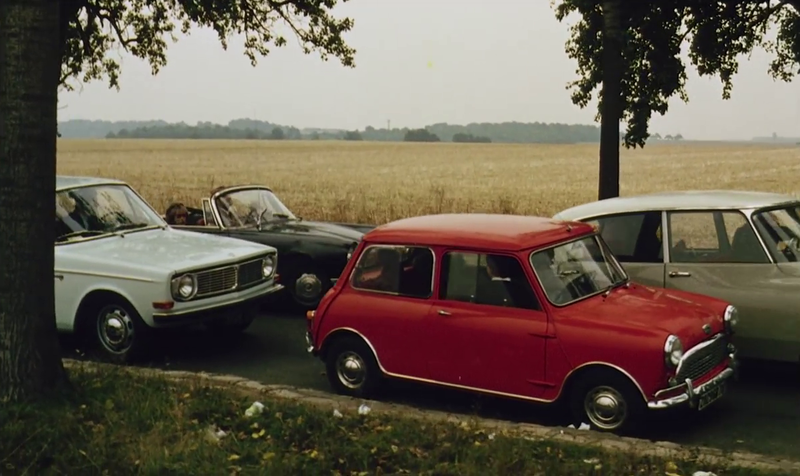 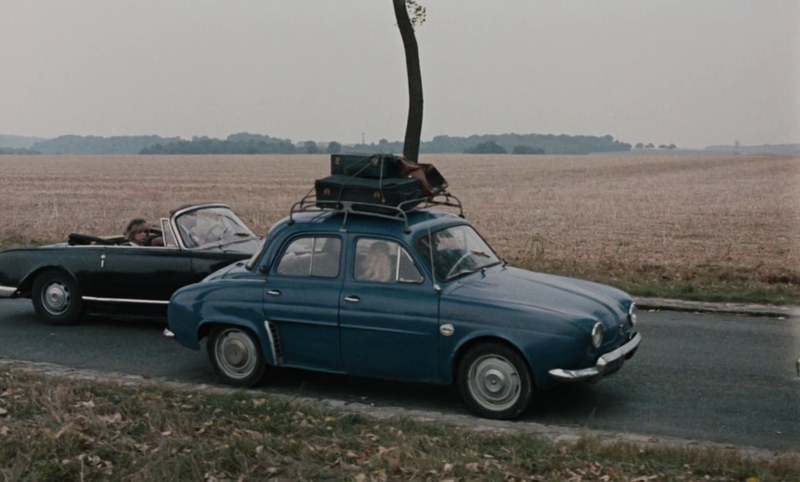 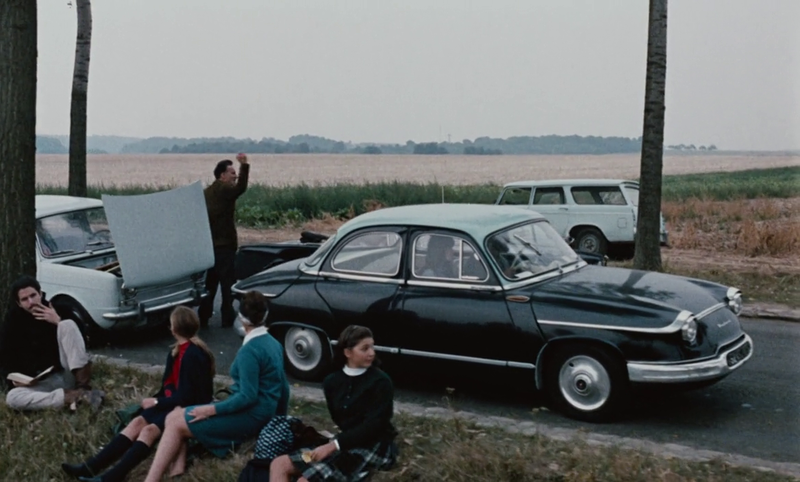 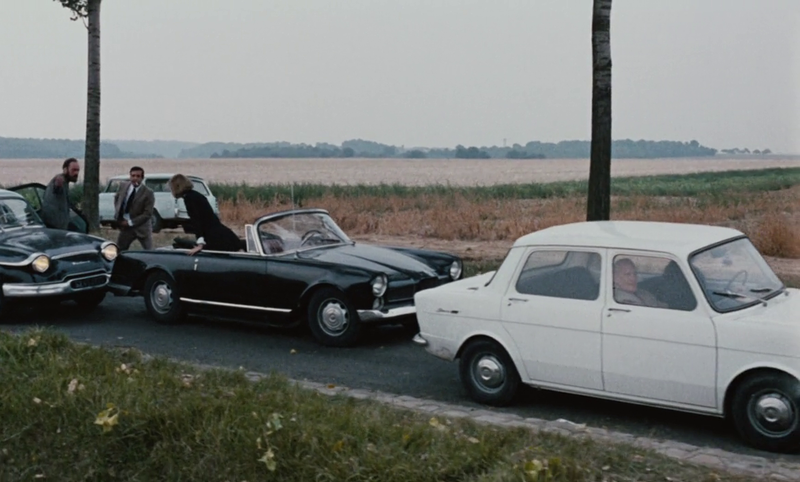 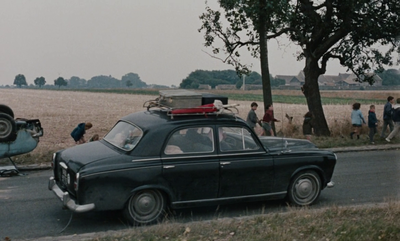 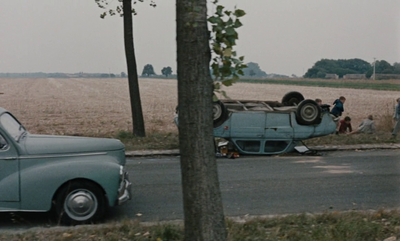 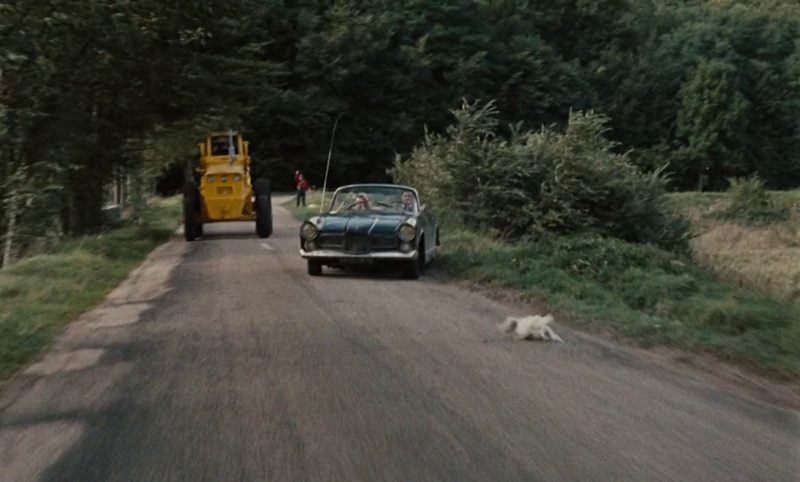 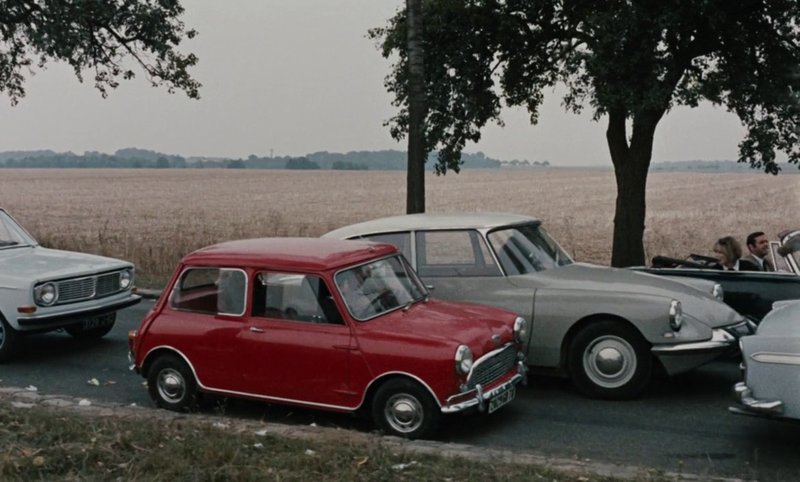 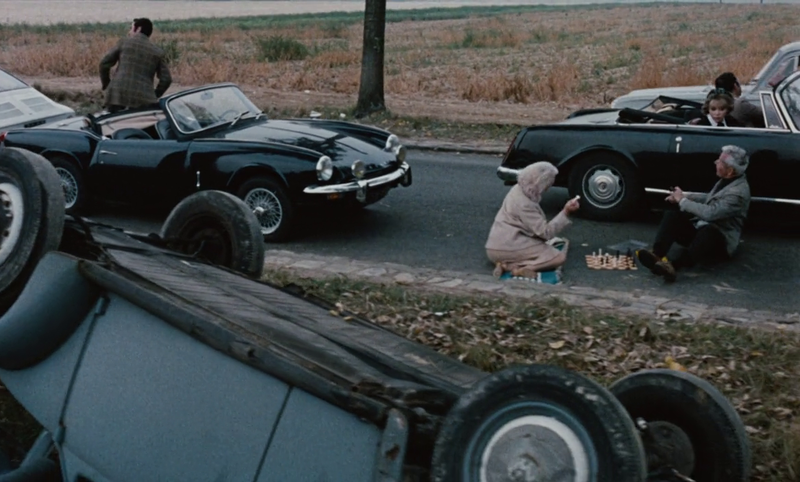 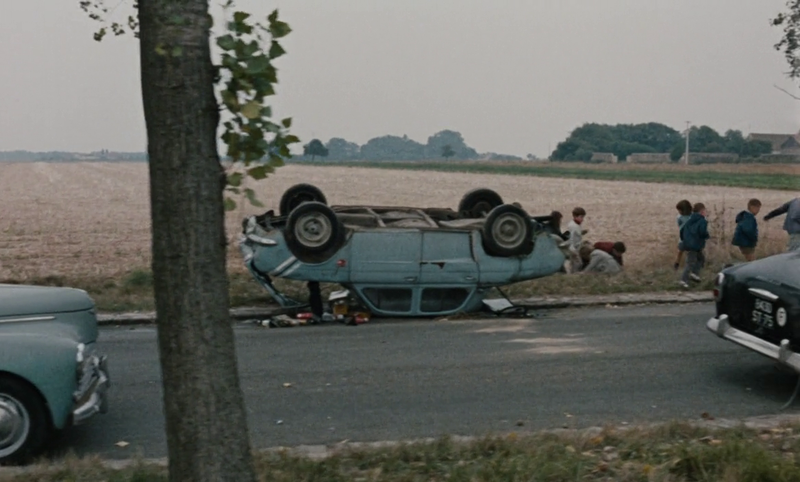 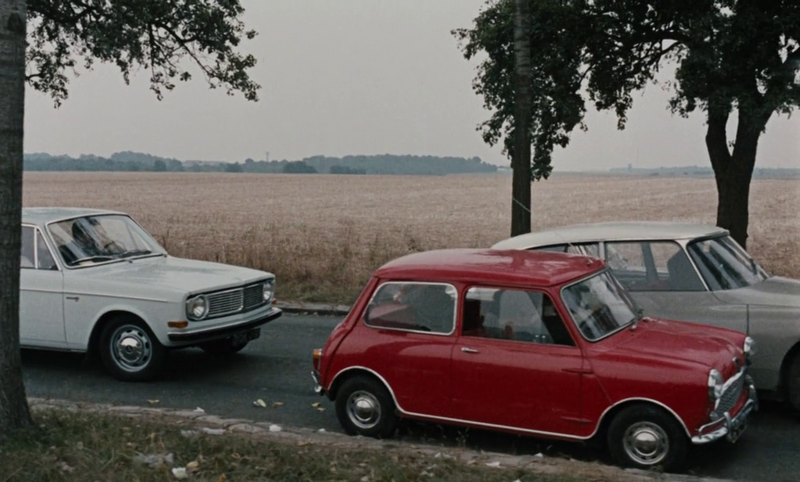 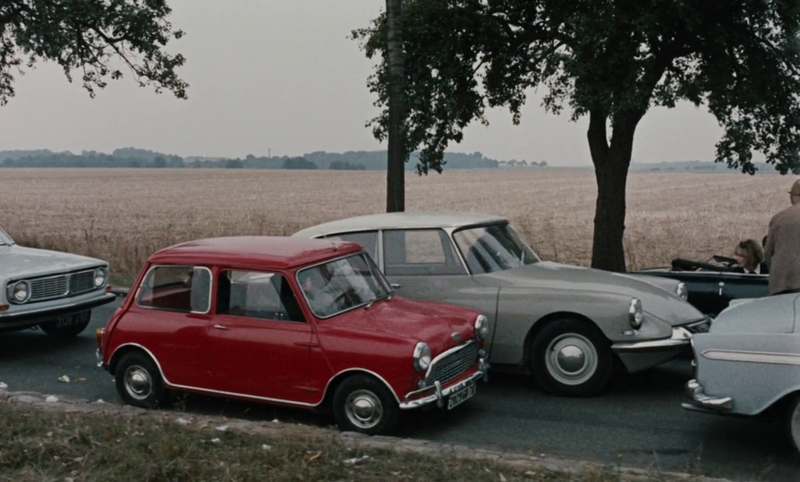 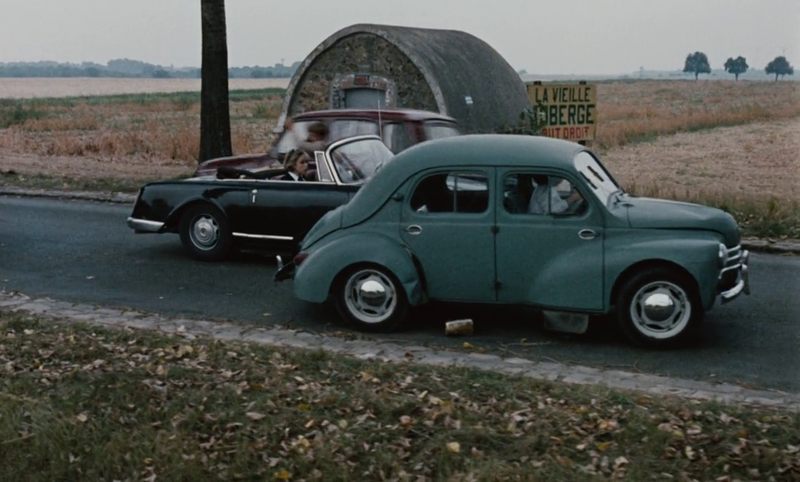 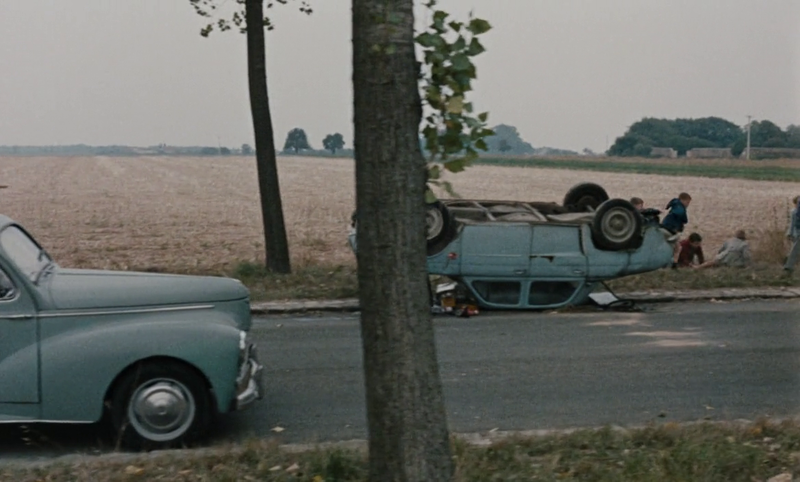 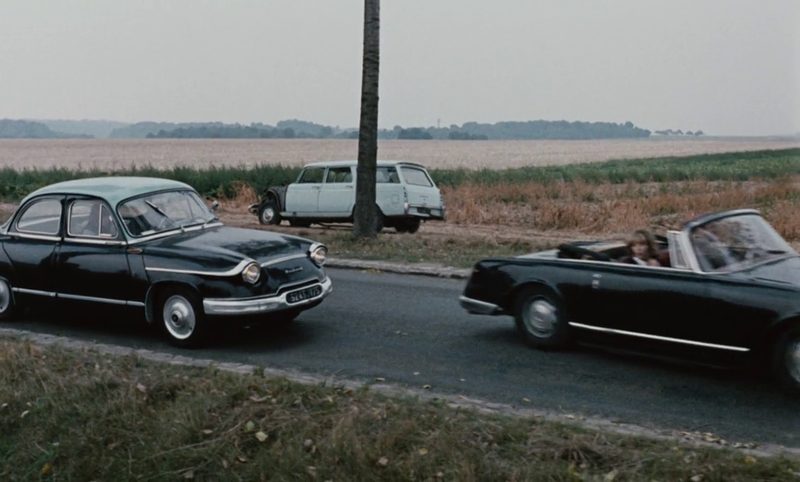 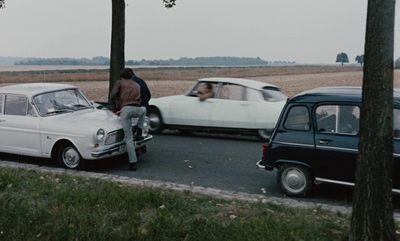 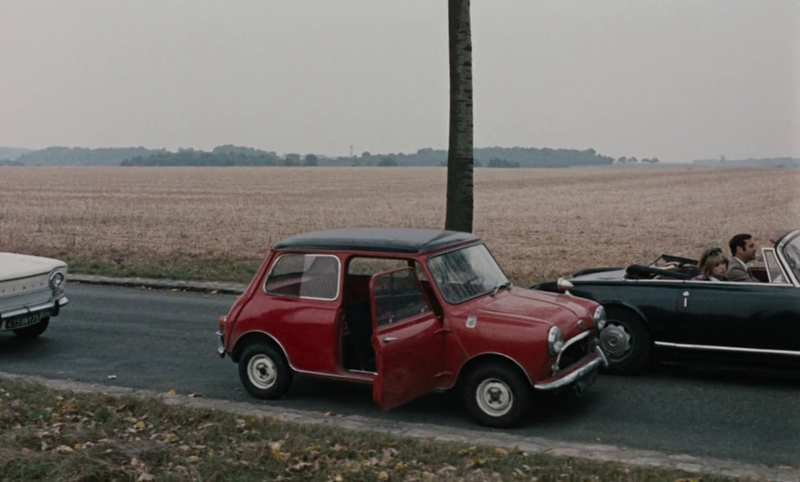 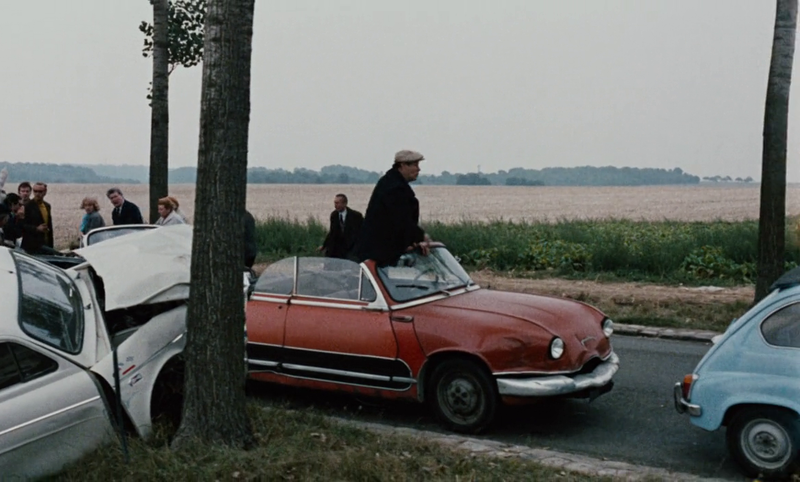 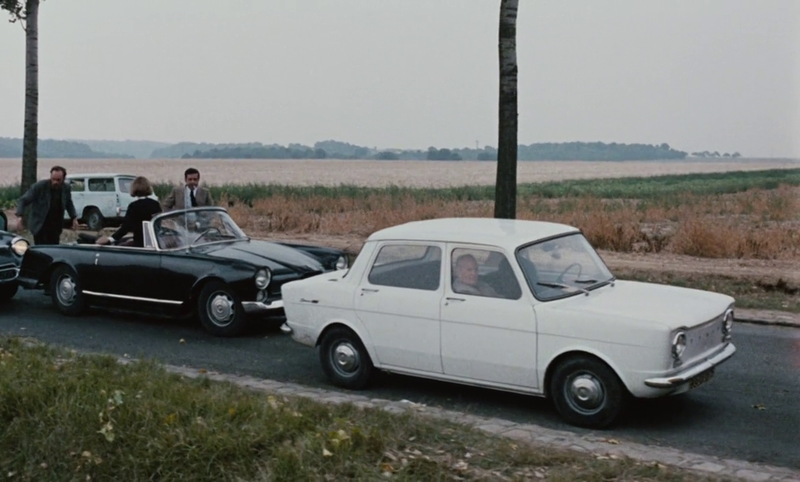 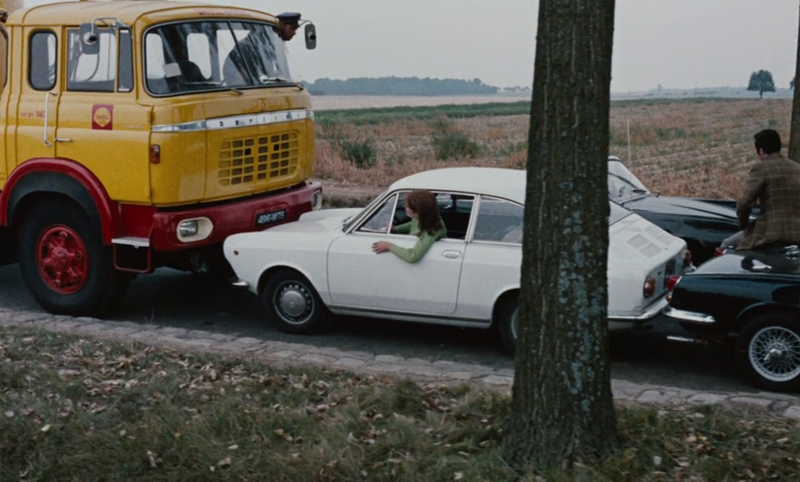 The car accident provoked by local hooligans is, in Bresson's film, a low-key anticipation of Godard's multiple crashes; the zoo animals on trucks in Godard's traffic jam echo the zoo scene in Au hasard Balthazar; and the tramp who rapes Corinne in a ditch is played by an actor from Bresson's film, Jean-Claude Guilbert. 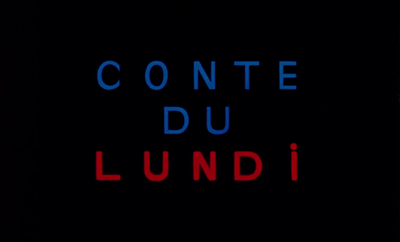 Week End is a film I like particularly because it relates to two of my chief research preoccupations: 1/ intertextual reference in film – there are many texts cited in Week End, an edition with footnotes would be a very useful thing; 2/ place in film – Week End is very much a film about France, and about particular areas of France. 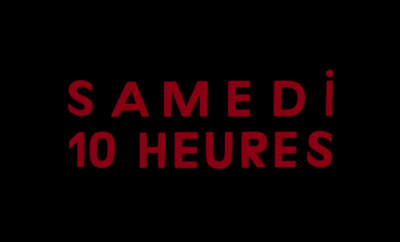 This introduction focusses on a third area: how Week End engages with time. It has a peculiar, a very specific, perhaps a unique way of engaging with time in relation to film. 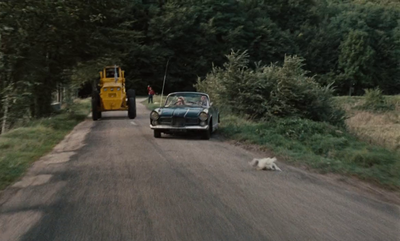 A keyword for Week End is speed. 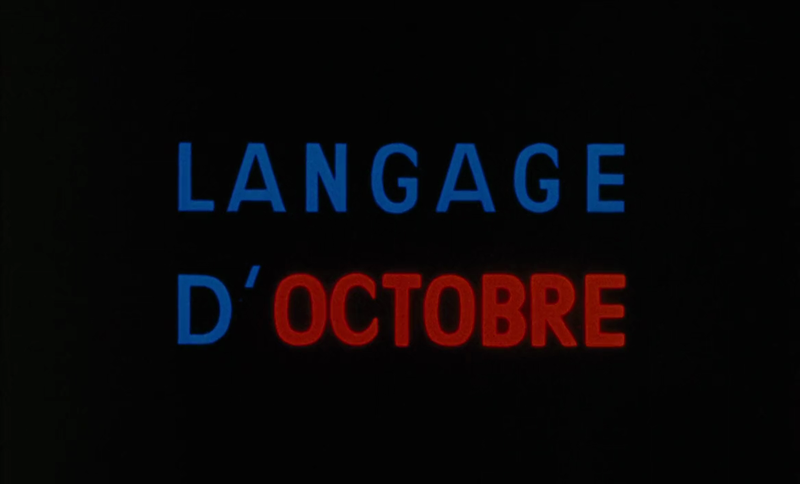 After a preamble, lots of conversation, lots of quotations from Georges Bataille, the principal characters set out on their journey, manifesting speed, you’d expect – they need to get somewhere quite urgently. 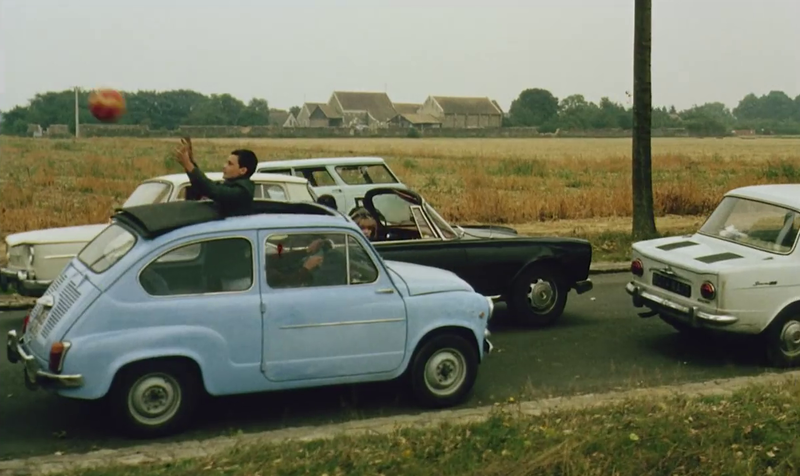 And the first thing you they encounter is a traffic jam, shown in what has been commonly called the longest take in cinema history. 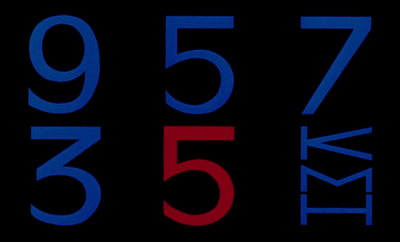 At seven minutes and fifty seconds, it may well have been that at the time. 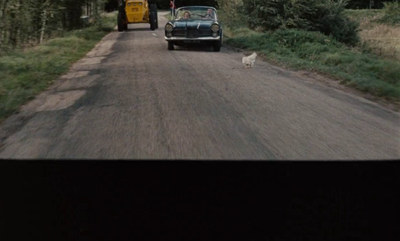 It’s a very long tracking shot along a stretch of road in the countryside. 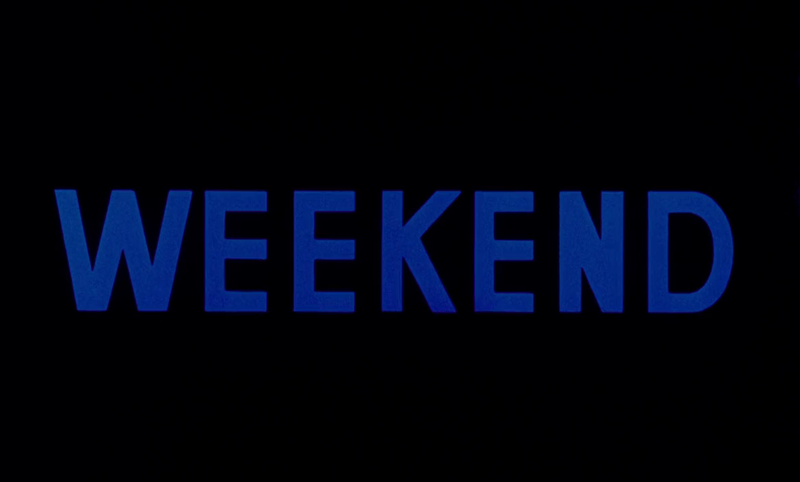 It’s very famous, the thing that people refer to most often in relation to Week End. 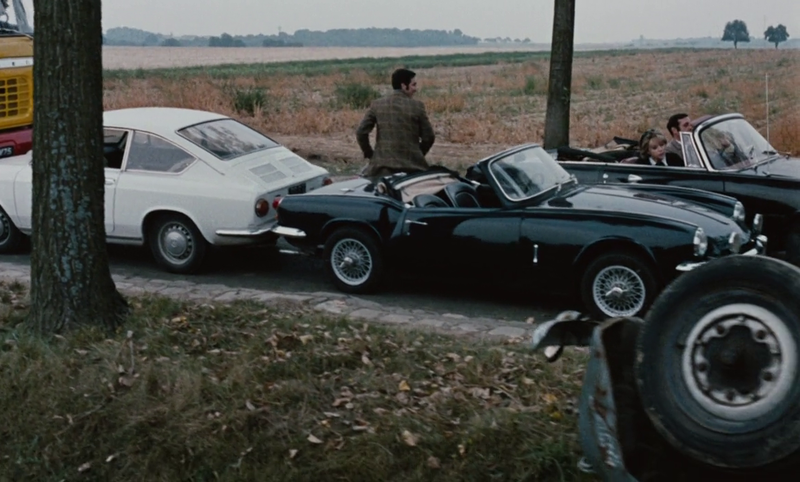 Speed is the essence, and that encumbrance to speed which is a traffic jam is right there at the beginning. 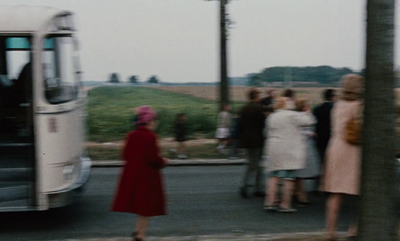 Once the protagonists get beyond the traffic jam, which they do quite quickly, they set off and move quite fast. 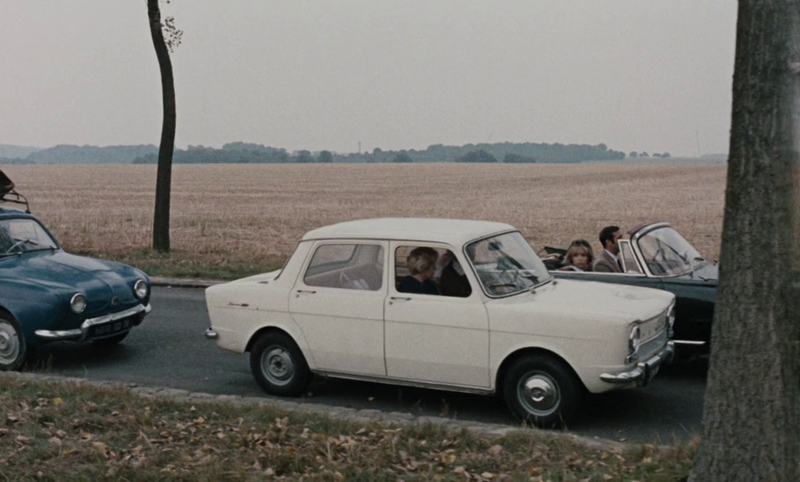 The wife complains to the husband that he’s not driving fast enough, he doesn’t know how to use the right gears, but they are heading quite quickly towards their destination. The way in which this is presented to us, which is one of the ways in which the film intervenes in relation to time, is with inserted titles. 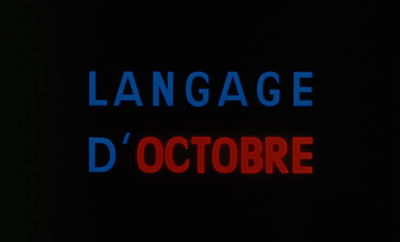 The film has graphically striking inserted titles, and they give us a sense of where we are exactly in time: Saturday 10.00, Saturday 11.00, and then 13.40, 14.10, Saturday 15.00, 16.00, 17.00. Our progress through the day is being marked quite clearly. 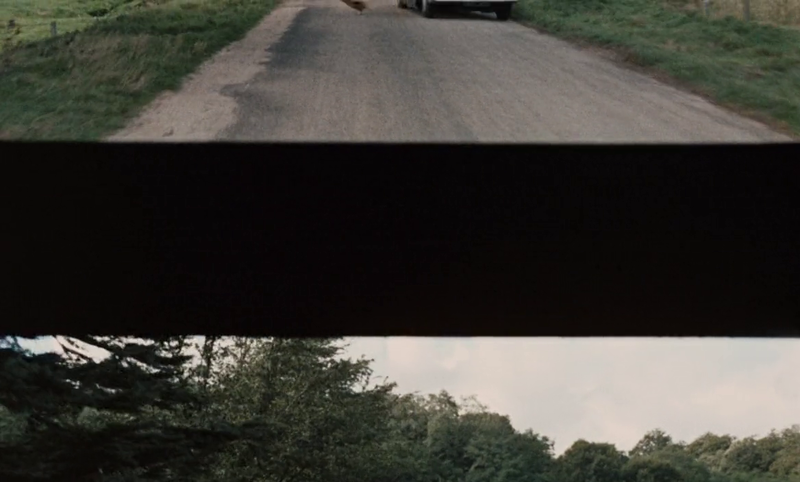 There is a problem here in relation to that long moment of real time, the seven-minute-fifty-second tracking shot, which fits a certain kind of theoretical concern about how cinema should just show the world in front of you, and if you don’t cut, if you don’t use montage, then you can just put the camera in front of the object and film it for as long as the object takes to be filmed, and there you have the world represented by cinema. That’s what that shot offers, except that there are those two titles that interrupt, one saying that the time is 13.40, the next saying that the time is 14.10. As you watch the sequence, that time does not pass, there’s no suggestion that in the seven minutes and fifty seconds it takes for that shot to play out that we have somehow had the ellipsis that would allow for half an hour to have passed. That seems to replicate the expression of the succession of time by months, except that at this point it’s going backwards. 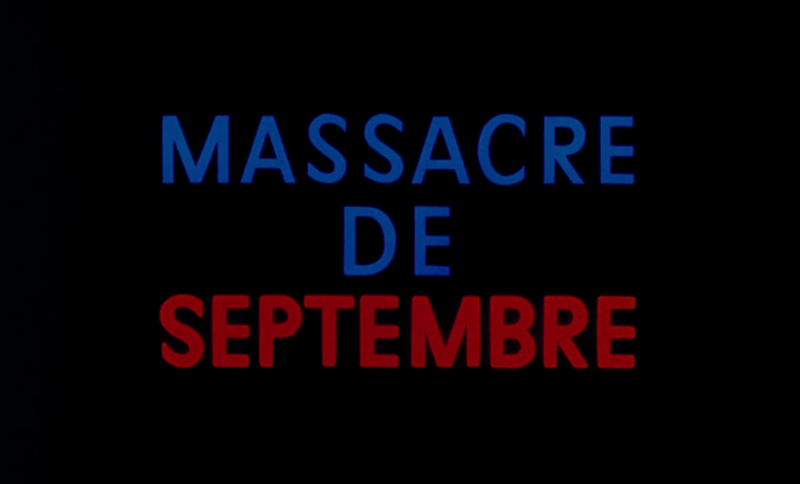 We go from July back to February then back to September. So time, in the way it’s marked by these titles, comes to a halt and then starts moving backwards. And what it’s moving back towards is the thing that those Republican names of months refer to, the French Revolution. 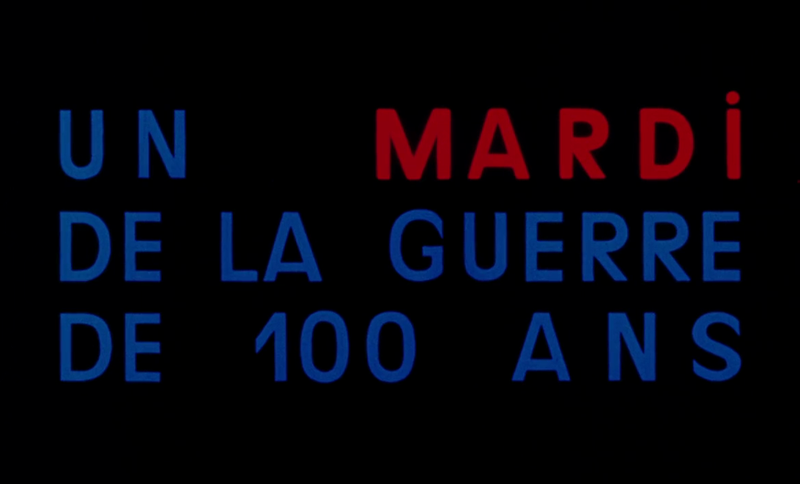 There are other mentions in the film of the French Revolution, which are the counterpart to the film's reference to current time, a real time of potential revolution in Africa, of potential revolution in the United States. 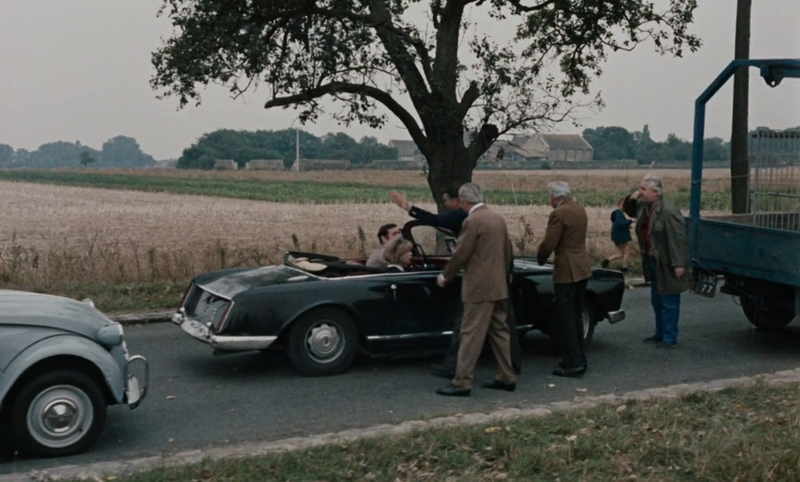 Reference to the French Revolution takes us back to 1791-92, the moment where contemporary history might be said to begin, the Age of Revolutions. 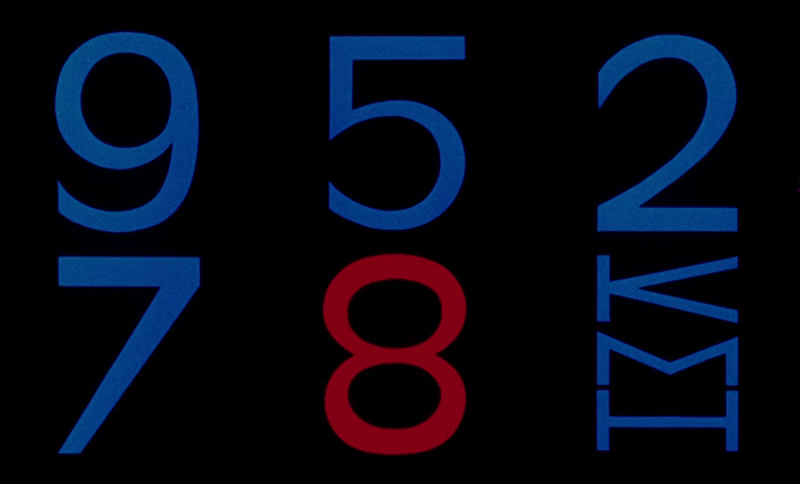 Time seems to stop there, but actually by the end of the film we are in a different time entirely. 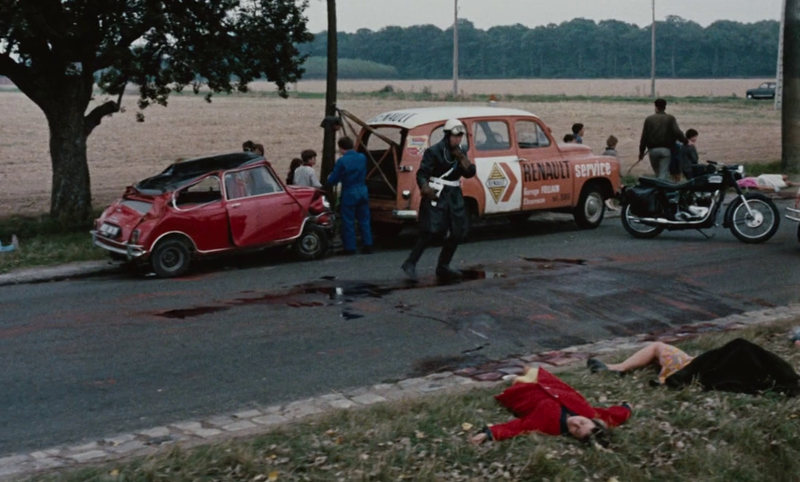 A time of a certain kind of revolution, an unreal and derisory revolution, that looks like we’ve gone back to pre-history, to something like the reverse of the Golden Age, a time when cannibalism was the norm, and where mutual violence would be what you might expect between competing societies. 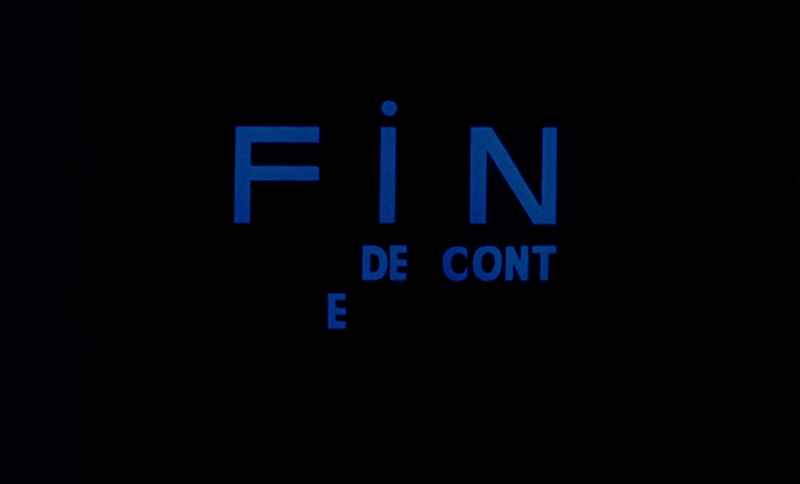 That’s the point at which the film ends, and it ends by making a connection between ‘bourgeois horror’, to quote Mao, who is quoted in the film, and a time of pre-historical horror. 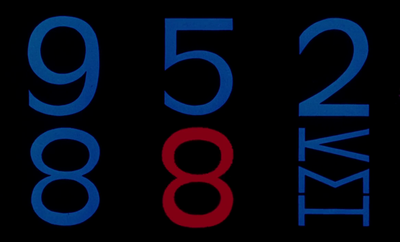 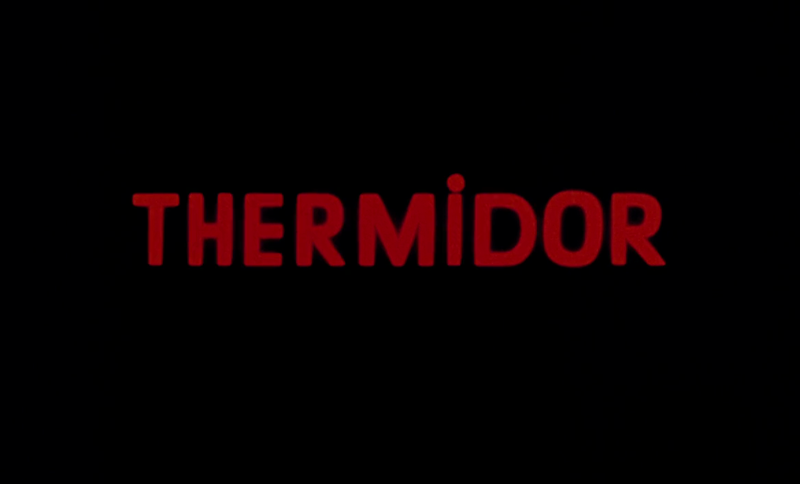 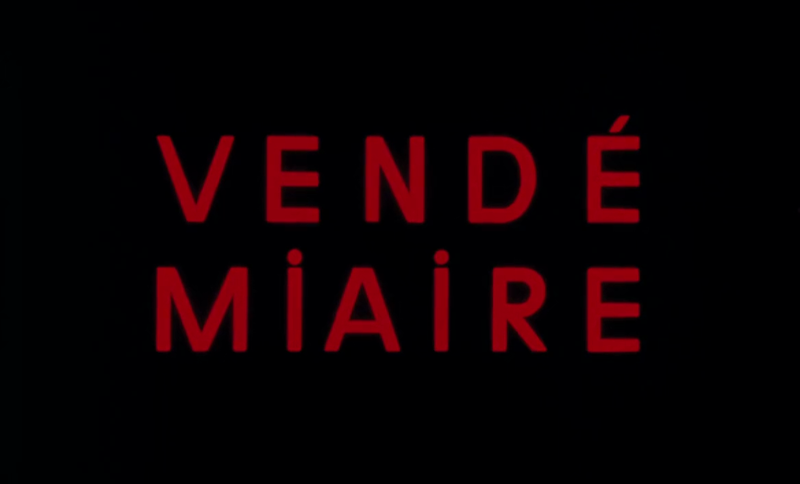 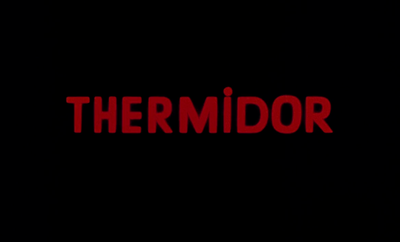 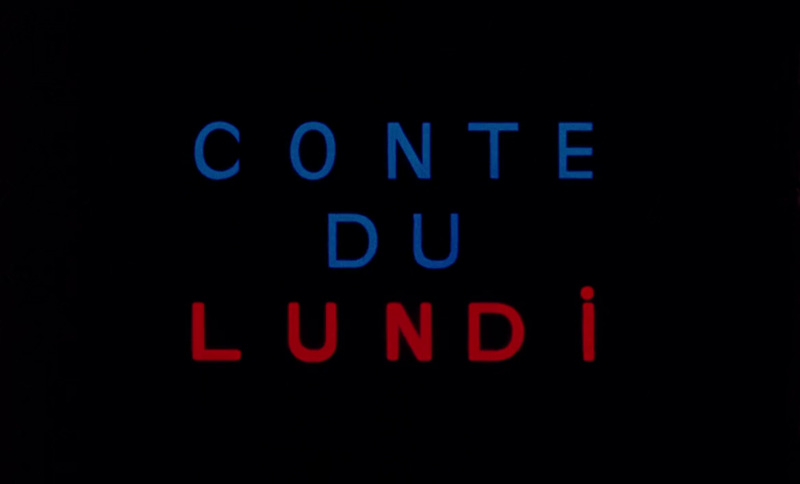 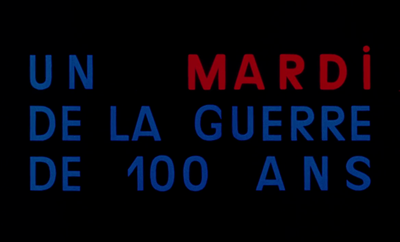 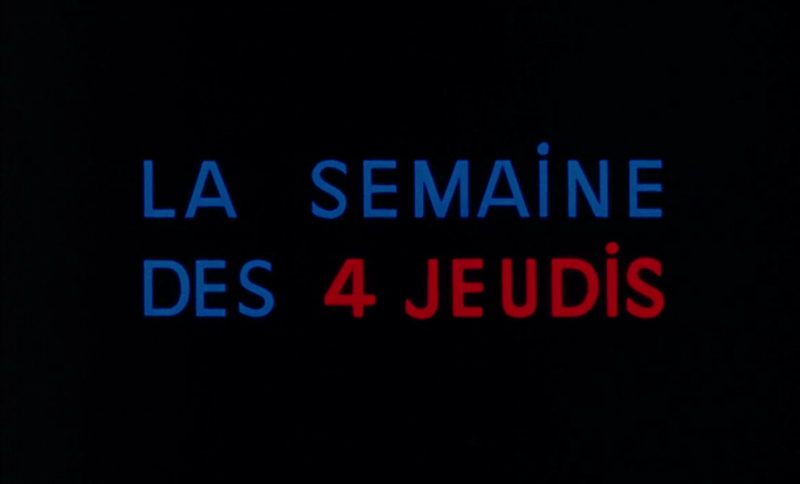 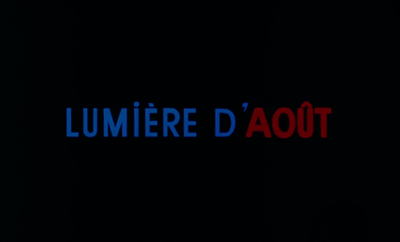 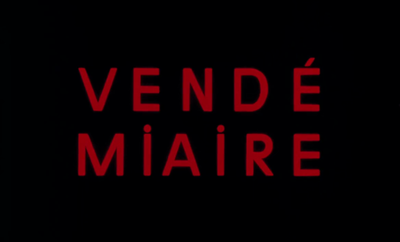 I don’t think this film, or indeed any other film by Godard in 1967, or any other film in 1967, is thinking about May ’68. Films can’t think in advance. 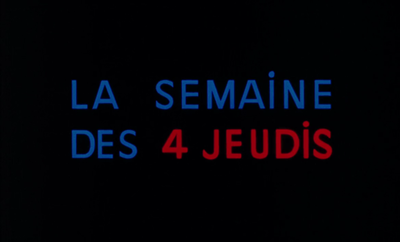 Week End is not premonitory of the kinds of social change and social unrest that will happen in May ’68, it doesn’t figure that kind of unrest. 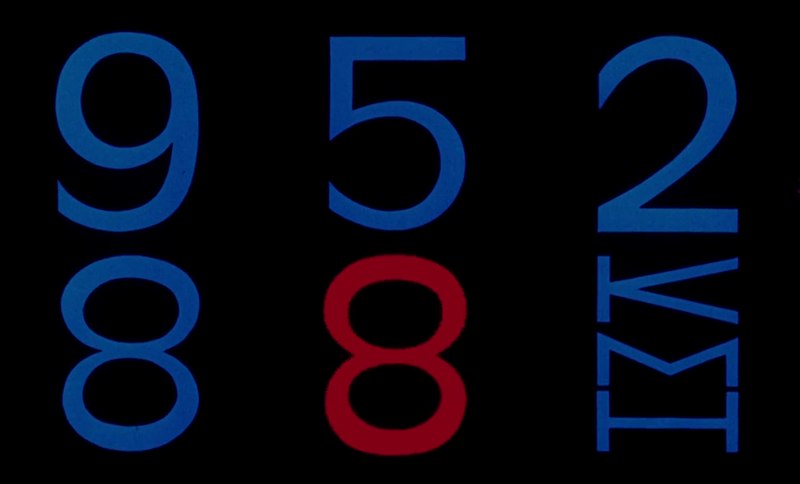 It talks about a complete different, dystopian moment of the breakdown of society. 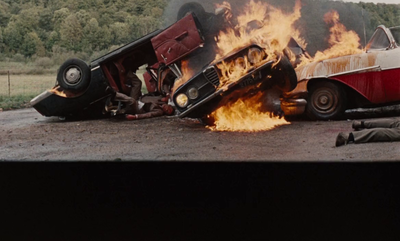 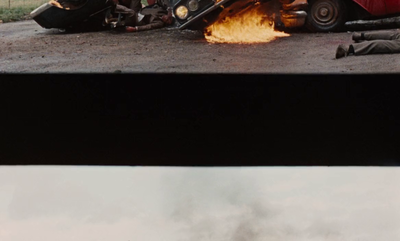 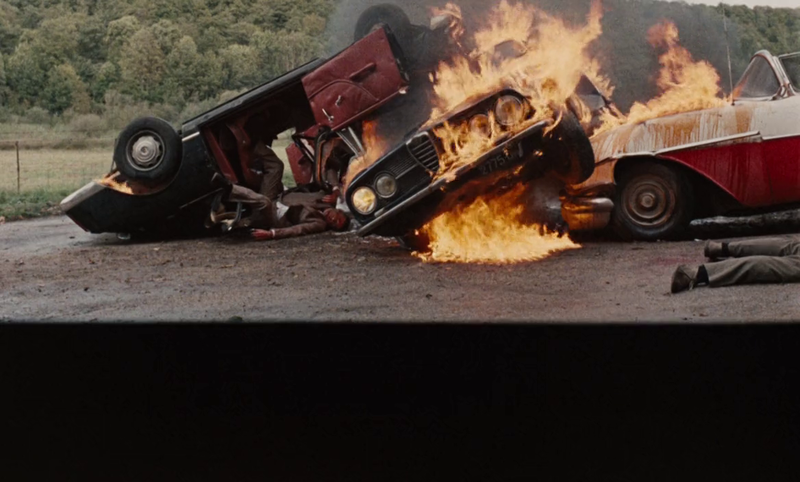 This disruption of the image is a formalised representation of the medium's breakdown, during which the medium continues to play with time, as the disrupted images are shown out of sequence: shots of the car burning are followed by shots of the car still on the road. 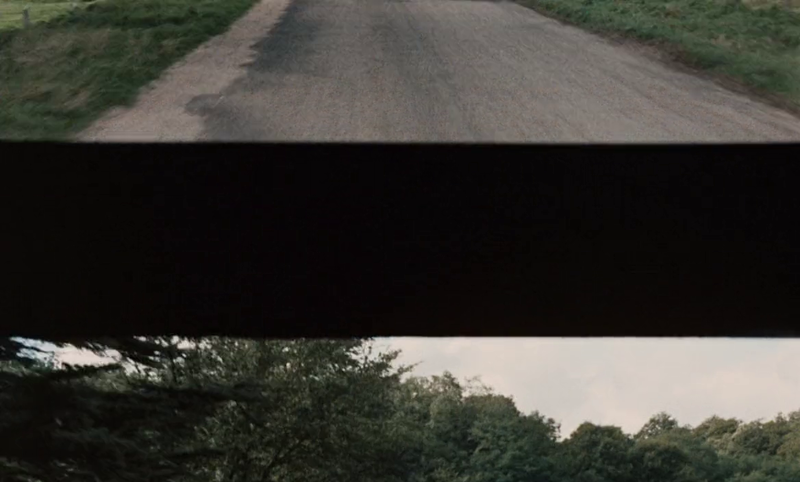 It is difficult to fix exactly what this sequence is doing, and for some exhibitors the difficulty was too much - in some prints this passage was removed, as if it were a mistake needing correction. 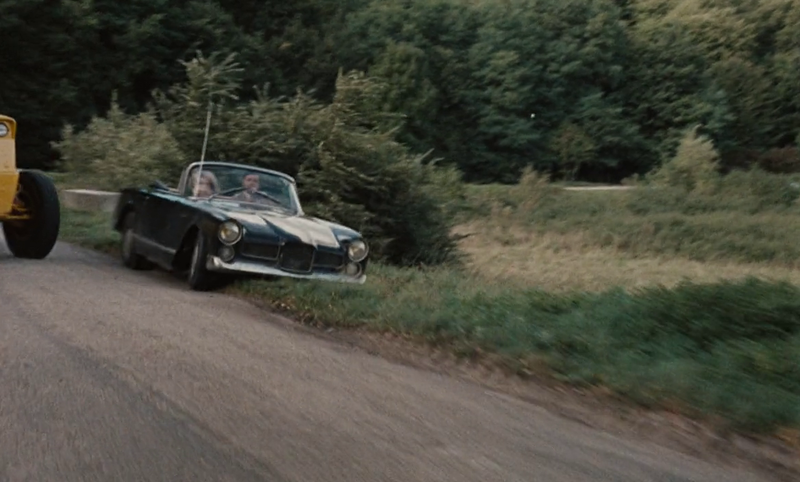 The car the protagonists set out in is a 1960 Facel Véga Facellia Cabriolet - my thanks to the IMCDB. 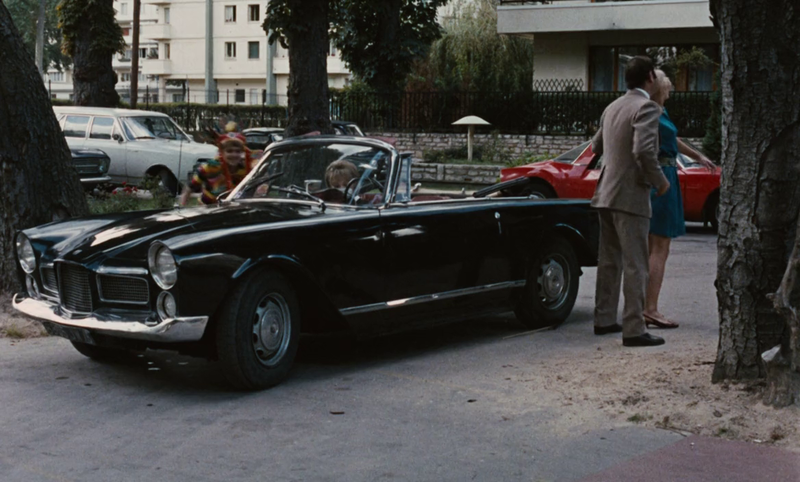 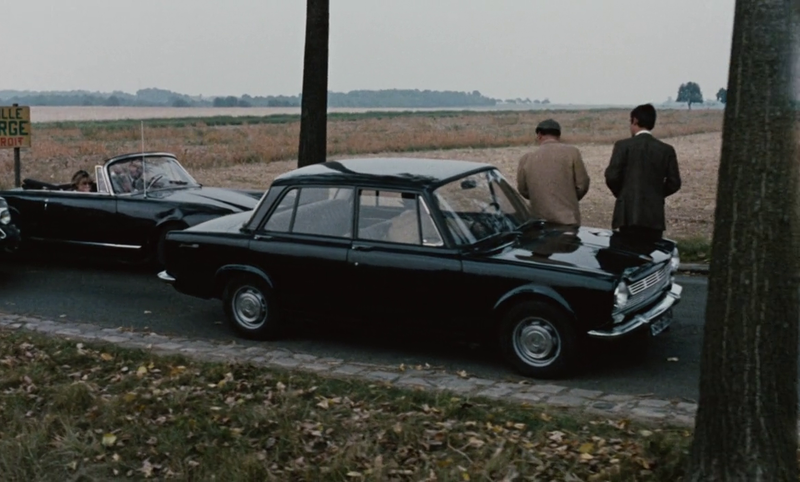 The Internet Movie Cars DataBase has identified many but not all of the vehicles in Week End. 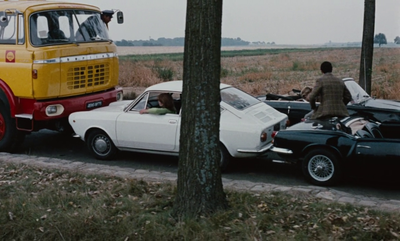 In the traffic jam there are forty-two vehicles, including the horse-drawn cart and the car-drawn yacht. 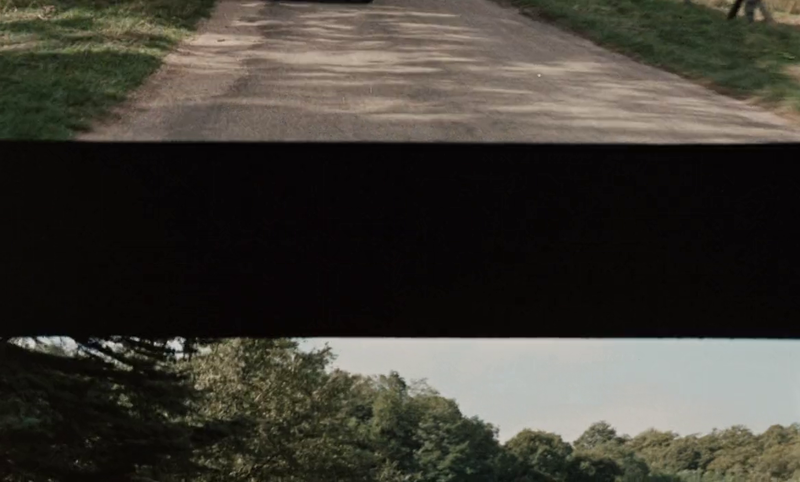 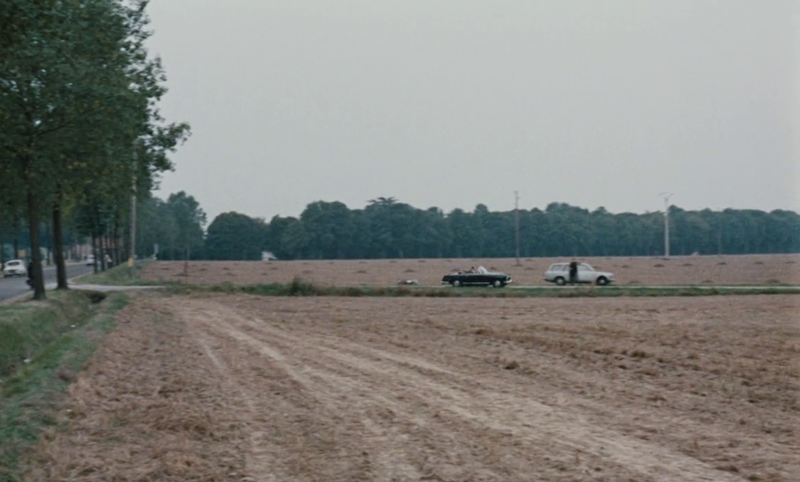 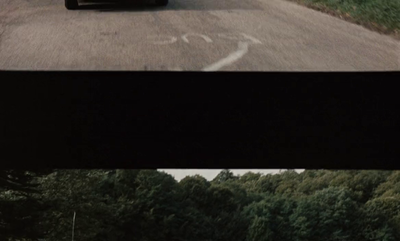 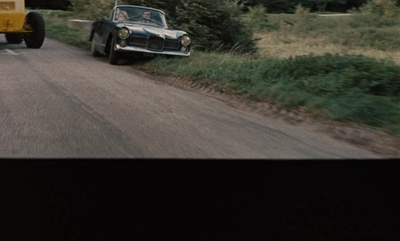 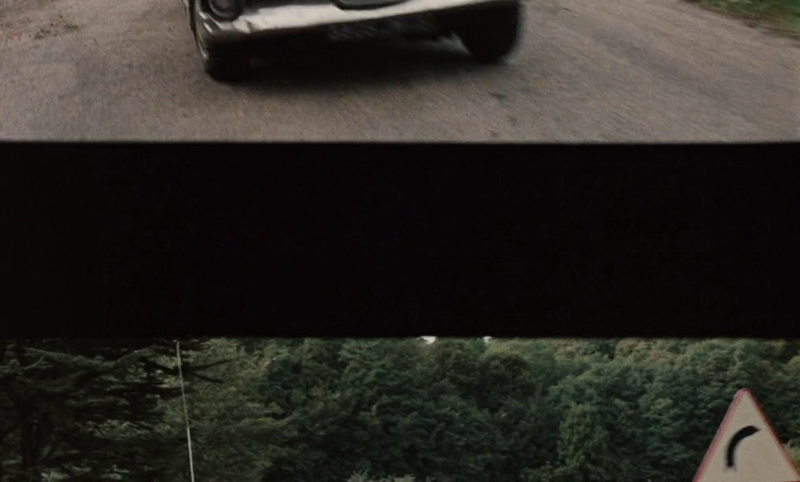 Three vehicles are approaching at the beginning of the shot (right), five pass down the route in the opposite direction, and there are two in the distance at the end of the shot. 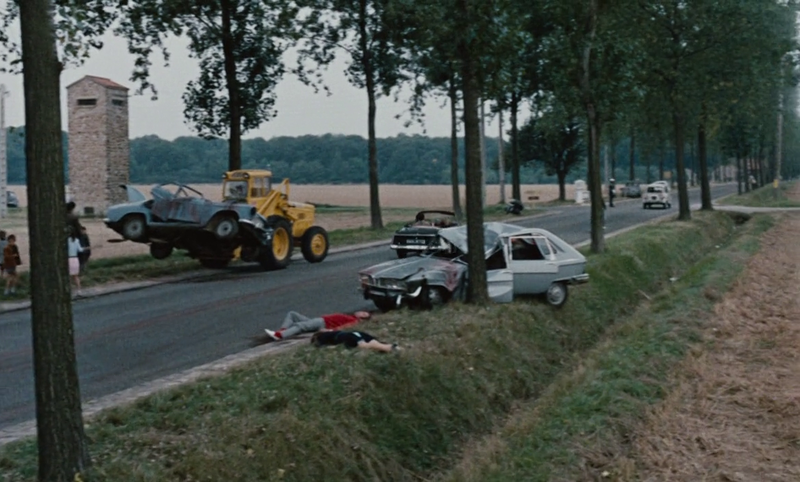 Adding to these the five wrecked cars by the roadside, the two recovery vehicles and the police motorcycle, and the Facel Véga, there are in total sixty-one vehicles in this sequence.